一种用于向无线设备提供来自无线局域网(WLAN)的网络广播信息的方法包括如下步骤：从一个或者多个可用无线网络或者网络数据库接收与该一个或者多个可用无线网络相关联的蜂窝网络广播信息；在普通容器消息中提供蜂窝网络广播信息，该普通容器消息在内容和格式上按照与所述一个或者多个可用蜂窝网络相关联的一个或者多个蜂窝标准而变化；并且使该普通容器消息由无线设备规则地进行广播，以接收和使用。 A method for providing network broadcast information from a wireless local area network (WLAN) is a wireless device comprising the steps of: available wireless networks or a network database or a plurality of receiving from the one or more available wireless networks associated with the cellular network broadcast information; providing the cellular network broadcast information message in the conventional case, the conventional case with the message according to one or more of one or more cellular standards associated with the available cellular networks vary in content and format; and that the ordinary container message is broadcast by a wireless device regularly in order to receive and use. 在一种可选择的方法中，步骤包括：规则地广播网络交互工作指示符，其中网络交互工作指示符表示来自WLAN的针对接收的蜂窝网络广播信息是否可用；从无线设备接收探查请求；并且接收来自无线设备的探查请求；将所述无线网络广播信息以普通容器消息的方式发送到无线设备。 In an alternative method, comprising the step of: regularly broadcast a network interworking indicator, where the network interworking indicator for showing cellular network information received from the WLAN is available; receiving a probe request from a wireless device; and receiving probe request from the wireless device; the wireless network broadcast information to the wireless device in the manner of an ordinary container message. 本发明要求序列号为No. 60/523515且申请日为2003年11月19日、发明名称为"为WLAN启用无线通信设备提供蜂窝网络信息的系统和方法"的美国临时专利申请的优先权益。  The present invention claims and Serial No. No. 60/523515 filed November 19, 2003, entitled "WLAN-enabled wireless communication devices to provide cellular network information system and method," U.S. Provisional Patent Application preferred interests. 本发明通常涉及与无线局域网（WLAN)和蜂窝网络进行通信的无线通信设备，更具体地涉及通过WLAN将用于一个或者多个蜂窝网络的蜂窝网络信息传递到移动站。  The present invention generally relates to wireless communication devices communicating with the wireless LAN (WLAN) and cellular networks, and more particularly, to delivery over the WLAN to the cellular network information for one or more cellular networks to a mobile station. 在无线局域网（WLAN)领域，现有的方法是通过使用二进制和原文信息广播特定于WLAN的信息。  In the wireless LAN (WLAN) field, a conventional method by using binary and textual information broadcast the information specific to the WLAN. 还有一种方案是使得WLAN能够与一个或者多个第三代伙伴计划（3GPP) 蜂窝网络进行通信，以便蜂窝用户在能够接入他们的蜂窝服务的同时，经由WLAN接入到更高的带宽。 Another solution is that WLAN to communicate with one or more of the Third Generation Partnership Project (3GPP) cellular networks in order to access the cellular user while their cellular services via the WLAN access to a higher bandwidth. WLAN最初设计用于无线LAN连通性；没有为蜂窝网络通信作出规定。  WLAN originally designed for wireless communication with the LAN; no provision made for cellular network communication. 传统上，一直没有提供一种合适的方法来通知是否存在WLAN和蜂窝网络之间的"交互工作"。 Traditionally, there has been no offer an appropriate method to notify the existence of "interworking" between the WLAN and cellular networks. 此外，一直没有建立用于识别一给定WLAN可以与哪一个蜂窝网络进行交互工作、或者允许移动站选择用于通信的蜂窝网络的任何其它信息的合适的技术。 In addition, it has not been established for identifying a given WLAN may be interworking with which a cellular network, or allows the mobile station to select any other information suitable technique for cellular network communication. 当前，WLAN可以广播用于标识自身的称为服务集ID(SSID)的原文字符串。  The current, WLAN may broadcast a textual string to identify itself called a service set ID (SSID) of. WLAN 操作员通常建立他们自己的专用于其需要的广播信息（即SSID)，包括像由智能客户应用使用的标记信息和/或名称这样的数据。 WLAN operator typically build their own dedicated broadcast their information needs (ie SSID), and including the tag information or data such as used by the smart client application / name. WLAN操作员不愿改变他们的广播SSID来使得他们与蜂窝网络标识符相兼容。 WLAN operators are reluctant to change their broadcast SSID to make them compatible with cellular network identifiers. 在多个网络中的互连需要用户识别模块（S頂）或者通用用户识别模块（US頂）用于识别用户。  In the plurality of network interconnection requires a subscriber identity module (S top) or Universal Subscriber Identity Module (US top) for identifying the user. US頂还包括用于标识允许用户使用的推荐和禁用网络的信息。 US further includes information for identifying the top to allow the user to use the network and disable recommended. 该信息作为移动国家代码（MCC)和移动网络代码（MNC)对存储到S頂或US頂中。 The information as a mobile country code (MCC) and Mobile Network Code (MNC) for storage or to the top S of the top US. 如果已将广播SSID 分配给WLAN，且WLAN操作员不希望改变该SSID，则不存在可以将MCC和MNC对从WLAN广播到移动站的已建立的方法。 If a broadcast SSID has been assigned to a WLAN, and the WLAN operator does not wish to change the SSID, MCC and MNC methods may be broadcast from the WLAN to the mobile station established does not exist. 存在一种允许移动站针对其它支持的SSID来探查WLAN的机制。  The present mechanism allows the mobile station for other supported SSID to probe the WLAN. 然而，如果WLAN 支持SSID，则该WLAN将只响应探查请求。 However, if the WLAN supports the SSID, the WLAN will only respond to a probe request. 因此，移动站将需要探查每个已知的网络以确定WLAN是否支持蜂窝网络交互工作。 Accordingly, the mobile station would need to probe every known network to determine whether the WLAN supports cellular network interworking. 这种方法耗时、效率低下，同时减少了移动站的电池寿命。 This method is time consuming, inefficient, and reduces the battery life of the mobile station. 因而需要一种将蜂窝网络信息提供给WLAN启用移动站的更加有效的方法。 Thus a need for a cellular network information to WLAN-enabled more efficient method of a mobile station. 这里描述了一种用于将网络广播信息从无线局域网（WLAN)提供给WLAN启用无线通信设备的方法和装置。  Here is described a method for network broadcast information from a wireless local area network (WLAN) to provide a method and apparatus WLAN-enabled wireless communication devices. 一种示范性方法包括如下步骤：从一个或者多个可用无线网络或者网络数据库接收与该一个或者多个可用无线网络相关联的无线网络广播信息；在普通容器消息中提供蜂窝网络广播信息，该普通容器消息在内容和格式上按照与所述一个或者多个可用蜂窝网络相关联的一个或者多个蜂窝标准而变化；并且使该普通容器消息针对接收规则地进行广播，同时由无线设备使用。  An exemplary method includes the steps of: receiving a wireless network the wireless network broadcast information associated with the available one or more from one or more available wireless networks or a network database; provides the cellular network broadcast message in the conventional case information, the ordinary container message varies in content and format according to one or more of the one or more cellular standards associated with the available cellular networks; and makes the ordinary container for receiving a broadcast message regularly, at the same time by the wireless Equipment. 在一种可选择的方法中，步骤包括：规则地广播网络交互工作指示符，其中网络交互工作指示符表示来自WLAN的针对接收方的蜂窝网络广播信息是否可用；从无线设备接收探查请求；并且将所述无线网络广播信息以普通容器消息的方式发送到无线设备，以响应来自无线设备的所述探查请求。  In an alternative method, comprising the step of: regularly broadcast a network interworking indicator, where the network interworking indicator indicates cellular network information for the recipient is available from the WLAN; probe receives from the wireless device request; and the wireless network broadcast information is transmitted in a normal manner container message to the wireless device in response to the probe request from the wireless device. 优选地，普通容器消息中的无线网络广播信息包括与不同类型的蜂窝网络相关联的蜂窝网络广播信息。  Preferably, the wireless network broadcast information common container message includes cellular network broadcast information with different types of cellular networks associated. 所述普通容器消息可以选择性地或者额外地包括来自可用于WLAN 的不同类型无线网络（例如Wi-ΜΧ)的无线广播消息。 The common container message may alternatively or additionally include a wireless broadcast messages from different types of wireless networks may be used for the WLAN (e.g., Wi-ΜΧ) a. 对本领域的普通技术人员来说，一旦参照下面结合附图描述的本发明的具体实施方式，本发明的其它方面和特征将变得显而易见。 One of ordinary skill in the art that, once the embodiment of the present invention are described below with reference to the accompanying drawings Other aspects and features of the invention will become apparent. 下面将仅借助于实例参照附图来描述本发明的实施方式。  Next will be described embodiments of the invention only by means of example with reference to the accompanying drawings. 在不同附图中的某些附图标记用于表示类似的元件。 Some of the figures in the different figures are used to indicate similar elements. 图8是可以在系统中使用的普通容器消息的消息格式的另一个实例。  FIG. 8 is another example of a message format of an ordinary container message which may be used in the system. 这里描述了一种用于将网络信息从无线局域网（WLAN)提供给WLAN启用(enabled)无线通信设备的方法和装置。  Described herein are methods and apparatus for network information from a wireless local area network (WLAN) provided to the WLAN enabled (Enabled) wireless communication device. 一种示范性方法包括如下步骤：从一个或者多个可用无线网络或者网络数据库接收与该一个或者多个可用无线网络相关联的无线网络广播信息；在普通容器消息中提供蜂窝网络广播信息，该普通容器消息在内容和格式上按照与所述一个或者多个可用蜂窝网络相关联的一个或者多个蜂窝标准而变化；并且使该普通容器消息针对接收方规则地进行广播，同时由无线设备使用。 An exemplary method comprises the steps of: receiving a wireless network the wireless network broadcast information associated with the available one or more from one or more available wireless networks or a network database; providing the cellular network broadcast information message in the conventional case, the Common container message varies in content and format according to one or more of the one or more cellular standards associated with the available cellular networks; the conventional case and the broadcast message for the recipient regularly, while using the wireless device . 在一种可选择的方法中，步骤包括：规则地广播网络交互工作指示符，其中网络交互工作指示符表示来自WLAN的针对接收方的蜂窝网络广播信息是否可用；从无线设备接收探查请求；并且将所述无线网络广播信息以普通容器消息的方式发送到无线设备，以响应来自无线设备的所述探查请求。 In an alternative method, comprising the step of: regularly broadcast a network interworking indicator, where the network interworking indicator indicates cellular network information for the recipient is available from the WLAN; receiving a probe request from a wireless device; and the wireless network broadcast information is transmitted in a normal manner container message to the wireless device in response to the probe request from the wireless device. 应当注意，所述普通容器消息可以选择性地或者额外地包括来自可用于WLAN的不同类型无线网络（例如Wi-ΜΧ)的无线网络广播信息。 It should be noted that the ordinary container message may alternatively or additionally include wireless network broadcast information from different types of wireless networks may be used for the WLAN (e.g., Wi-ΜΧ) a. 因此，这些技术将网络广播信息提供给WLAN启用无线设备，为了网络选择的目的，该无线设备可以利用该信息。  Thus, these techniques provide network broadcast information to WLAN-enabled wireless device, for purposes of network selection, the wireless device can use this information. 可以通过WLAN、以规则的间隔来广播网络广播信息，或者通过无线设备从WLAN进行请求。 It can be requested from the WLAN through the WLAN by a wireless device, at regular intervals to broadcast network information, or. 优选地，蜂窝网络信息被包括在普通容器消息中，该普通容器消息在内容和格式上按照与所述一个或者多个可用于WLAN的蜂窝网络相关联的一个或者多个蜂窝标准而变化。 Preferably, the cellular network information is included in the message in the conventional case, the message according to the conventional case with the one or more may be used in a cellular network WLAN associated or more cellular standards vary in content and format. 如果使用请求的方法，则无线设备通过发送针对与WLAN相关联的公知服务集标识符（SSID)的探查请求来请求网络广播信息。 If the request method, a probe request for the wireless device associated with known WLAN Service Set Identifier (SSID) to request the network broadcast information by sending. 一旦接收到探查请求，WLAN 就将所述普通容器消息发送到无线设备以响应一个探查。 Upon receiving the probe request, WLAN will transmit a common container message to the wireless device in response to a probe. 在这种请求方法中，来自WLAN的广播信息包括用于指示网络交互工作可用的指示符（例如一个标记）。 In this process the request, the broadcast information from the WLAN includes an indicator for indicating that the network interworking is available (e.g., a marker). 一旦检测到该指示符，无线设备就执行探查请求以获取网络广播信息。 Upon detecting the indicator, the wireless device can perform a probe request to obtain the network broadcast information. 现在参照附图，图1是示出了在无线通信系统100中运行的无线通信设备102的基本组成部分的示意性框图。  Referring now to the drawings, FIG. 1 is a schematic block diagram illustrating the basic components of a wireless communication device operating in the wireless communication system 100 102. 如图1所示，无线设备102适合于与无线局域网（WLAN) 190 进行通信。 1, wireless device 102 adapted to communicate with a wireless local area network (WLAN) 190. 同样还示出，无线设备102还可以适合于与作为蜂窝电信网络的无线通信网络104进行通信。 Also shown, the wireless device 102 may also be adapted to communicate with a wireless communication network 104 as a cellular telecommunication network. 对于与无线网络104的无线通信来说，无线设备102使用射频（RF)收发信机电路108a和天线110a。 For wireless communication with the wireless network 104, the wireless device 102 using radio frequency (RF) transceiver circuitry 108a and antenna 110a. 对于与WLAN190的无线通信来说，无线设备102使用RF收发信机电路108b和天线110b。 For WLAN190 of wireless communication, the wireless device 102 using RF transceiver circuitry 108b and an antenna 110b. 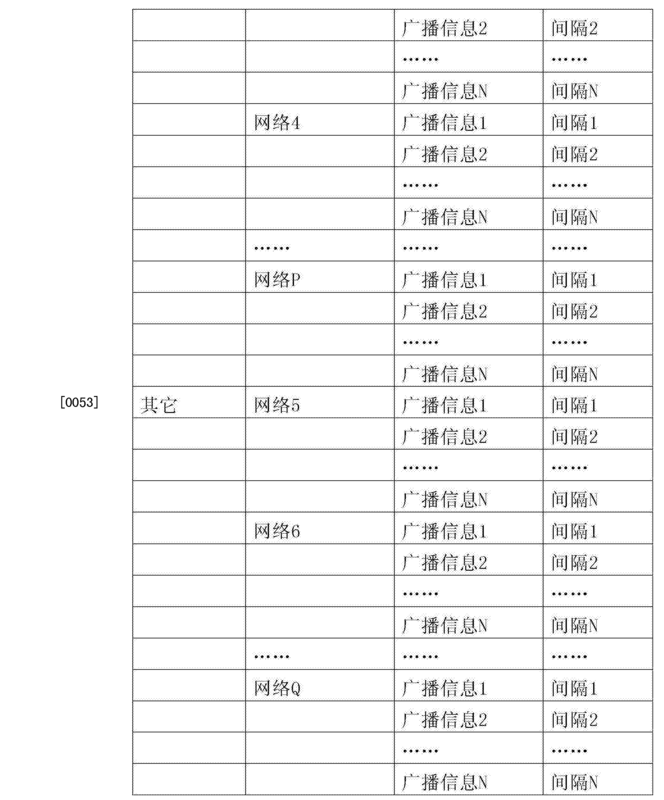 可以将具有这种配置的无线设备102称为"双模"通信设备。 The wireless device 102 having such a configuration may be referred to as a "dual mode" communication device. 尽管在图1中示出的无线设备具有分开且独立的收发信机部件，但至少上述收发信机部件的某些部分或部件（换言之不同的收发信机）在可能的情况下可以共享。 Although shown in FIG. 1 is a wireless device having separate and independent transceiver components, but some portions or components of at least the transceiver means (in other words different transceivers) in possible can be shared. 应当注意无线设备102可以选择性的为不具有RF收发信机108a和天线IlOa (而宁可说是仅与WLAN190进行通信）的"单模"设备。 It should be noted that wireless device 102 may alternatively an RF transceiver 108a and antenna IlOa without (but rather only communicate with WLAN190) of the "single mode" device. 无线设备102优选地包括可视显示屏112、键盘114,而且可能的话还包括一个或者多个辅助用户接口（UI) 116,上述部件中的每一个都与控制器106相连接。  The wireless device 102 preferably includes a visual display 112, a keyboard 114, and possibly further including one or more auxiliary user interfaces (UI) 116, each of the above components are connected to the controller 106. 控制器106还与RF收发信机电路108a和天线IlOa以及RF收发信机电路108b和天线IlOb相连接。 The controller 106 is also connected to RF transceiver circuitry 108a and antenna IlOa and the RF transceiver circuitry 108b and an antenna IlOb. 通常情况下，控制器106具体化为运行在存储器部件（未示出）中的操作系统软件的中央控制单元（CPU)。 Typically, controller 106 is embodied as a run in the memory means (not shown) of the operating system software of the central control unit (CPU). 控制器106通常控制整个无线设备102的操作，而与通信功能相关联的信号处理操作通常在RF收发信机电路中执行。 The controller 106 typically controls the overall operation of the wireless device 102, whereas signal processing operations associated with communication functions are typically performed in RF transceiver circuitry. 控制器106与设备显示屏112相连用于显示接收的信息、存储的信息、用户输入等等。 The controller 106 is connected to the device display 112 to display received information, stored information, user inputs and the like. 通常，提供可以是电话类型小键盘或者全字母数字键盘的键盘114用于输入在无线设备102中存储的数据、发送到网络104的信息、发出电话呼叫的电话号码、在无线设备102上执行的命令以及可能的其它或者不同的用户输入。 Typically, there is provided may be a telephone type keypad or full alphanumeric keyboard, keypad 114 for inputting data stored in a wireless device 102, transmitted to the network 104, makes a telephone number telephone calls executed on the wireless device 102 command and possibly other or different user inputs. 无线设备102基于无线通信链路来发送通信信号并且接收通信信号。  The wireless device 102 transmits a communication signal based on a wireless communications link and receive a communication signal. 例如，无线设备102可以经由天线IlOa与无线网络104进行通信。 For example, wireless device 102 may communicate with a wireless network via the antenna 104 IlOa. RF收发信机电路108a执行类似于无线电网络（RN) 128的功能的功能，例如包括调制/解调和可能的编码/解码以及加密/解密。 RF transceiver circuitry 108a performs functions similar to functions 128 of the radio network (RN), including for example modulation / demodulation and possibly encoding / decoding and encryption / decryption. 同样期待的是RF收发信机电路108a还可以执行除了通过RN128执行的那些功能之外的某些功能。 The same is expected that RF transceiver circuitry 108a may perform certain functions in addition to those functions performed by RN128. 对本领域的普通技术人员显而易见的是，RF射频收发信机电路108a将适合于特定的无线网络或者无线设备102试图在其中运行的网络。 One of ordinary skill in the art apparent, RF RF transceiver circuitry 108a will be adapted to particular wireless network or a wireless network in which the device 102 attempts to run. 无线设备102包括用于接收一个或者多个可充电电池124的电池接口122。  The wireless device 102 includes means for receiving one or more rechargeable batteries 124. Battery interface 122. 电池124为无线设备102中的电子电路提供电力，而电池接口122为电池124提供一种机械和电子连接。 Battery 124 provides power to the wireless device 102 is an electronic circuit, and battery interface 122 provides for a mechanical and electrical connection for the battery 124. 电池接口122与调整设备功率的调整器126相连。 Battery interface 122 and a power adjuster connected to the adjustment device 126. 无线设备102还使用诸如用户识别模块（S頂)、通用S頂(US頂）或者可拆卸的用户识别模块（RS頂）这样的存储器模块120进行操作，该存储器模块120在接口118处连接到或者插入到无线设备102中。 The wireless device 102 also used as a subscriber identification module (S top), top Universal S (US top), or a Removable User Identity Module (RS top) of such a memory module 120 is operated, the memory module 120 is connected to the interface 118 at or 102 inserted into the wireless device. 无线设备102可以由诸如数据通信设备、蜂窝电话、具有数据和语音通信能力的多功能通信设备、能够用于无线通信的个人数字助手（PDA)或者结合有内部调制解调器的计算机这样的单一单元组成。 Multiple-function communication device  The wireless device 102 may be formed such as a data communication device, a cellular telephone, having a data and voice communication capabilities, a personal digital assistant (PDA) can be used for wireless communication, or a combination of such single computer with an internal modem units. 作为选择，无线设备102可以是包含多个独立部件的多模单元，所述多个独立部件包括但不限于计算机或者与无线调制解调器相连的其它设备。 Alternatively, wireless device 102 may be a plurality of separate mold unit comprising a plurality of components, said plurality of separate components, including but not limited to a computer or other device connected to a wireless modem. 特别是，例如在图1的无线设备框图中，RF收发信机电路108a和天线IlOa可以实现为能够插入到膝上型电脑的端口中的无线电调制解调器单元。 In particular, for example, the wireless device block diagram of FIG. 1, RF transceiver circuitry 108a and antenna IlOa may be implemented as a laptop can be inserted into a port in a radio modem unit. 在这种情况下，该膝上型电脑包括显示屏112、键盘114、一个或者多个辅助UI116以及具体化为计算机CPU的控制器106。 In this case, the laptop computer includes a display 112, a keyboard 114, and one or more secondary UI116 controller 106 embodied as the computer's CPU. 同样期待的是，不能够进行正常无线通信的计算机或者其它设备可能适合于连接到诸如上述无线设备其中之一的单一单元设备的RF收发信机108a和天线110a，并且有效地假定对它们的控制。 Also expected to be able to carry out a computer or other equipment not normally a wireless communication may be adapted to be connected to the RF transceiver 108a, such as a single-unit device of one of the wireless devices and wherein the antenna 110a, and effectively assume control of their . 这样一种无线设备102可能具有后面所述的涉及图2的移动台202的更加具体的实施方式。 Such a wireless device 102 may have more specific embodiment relates to a mobile station of FIG. 2 described later 202. 尽管这里使用了一种特定的通信技术进行了描述，但是无线网络104可以根据任何适合的通信协议进行操作，尤其是宽带码分多址（W-CDM)和基于全球演进的增强数据传输速率技术（EDGE)。  As used herein, although a particular communication technology has been described, but the wireless network 104 may operate according to any suitable communication protocol, especially Wideband Code Division Multiple Access (W-CDM), and based on the enhanced data for global evolution technical transmission rate (EDGE). 在图1的实施方式中，无线网络104是基于CDMA技术的第三代（3G) 支持网络。 In the embodiment of FIG. 1, wireless network 104 is based on the third-generation CDMA technology (3G) supported network. 特别是，无线网络104是包括如图1所示连接的固定网络部件的CDMA2000网络。 In particular, wireless network 104 is a CDMA2000 network comprising a fixed network in FIG connection member shown in FIG. CDMA2000类型的无线网络104包括无线电网络（RN) 128、移动交换中心（MSC) 130、信令系统(SS7)网络140、本地位置寄存器/鉴权中心（HLR/AC) 138、分组数据服务节点（PDSN) 132、 IP网络134以及远程认证拨入用户服务（RADIUS)服务器136。 CDMA2000 type of wireless network 104 includes a radio network (RN) 128, a Mobile Switching Center (MSC) 130, a signaling system (SS7) network 140, home location register / authentication center (HLR / AC) 138, a Packet Data Serving Node ( PDSN) 132, IP network 134, and a remote authentication dial-In user service (RADIUS) server 136. SS7网络可通信地与网络142 (诸如公共交换电话网络即PSTN)相连，而IP网络可通信地与网络144 (诸如因特网） 相连。 SS7 network 142 can communicate with the network (i.e., such as a public switched telephone network PSTN) is connected, whereas IP network is communicatively connected to a network 144 (such as the Internet). 在操作期间，无线设备102与RN128进行通信，该RN128执行诸如呼叫建立、呼叫处理和移动性管理这样的功能。  During operation, wireless device 102 communicates with RN128, RN128 perform operations such as the call setup, call processing such functions and mobility management. RN128包括为通常称为"小区"的特定覆盖区域提供无线网络覆盖的多个基站收发信机系统。 RN128 comprises providing a plurality of base transceiver system of a wireless network coverage is commonly referred to as a "cell" of a particular coverage area. 诸如图1中示出的RN128的给定基站收发信机系统将通信信号发送到位于其小区内的无线设备，并且从位于其小区内的无线设备接收通信信号。 RN128 in FIG. 1 as shown in a given base station transceiver system of a wireless communication device transmits signals in a cell in place thereon, and receive communication signals from wireless devices located within its cell. 基站收发信机系统通常在其控制器的控制下，根据特定的、通常为预先确定的通信协议和参数来执行诸如对要被发送到无线设备的信号进行调制、以及可能的编码和/或加密这样的功能。 The base station transceiver system normally under control of its controller, such as a signal to be transmitted to the wireless device modulates and possibly encoding and / or encryption particular, usually performs the communication protocols and parameters determined in advance in accordance with such a feature. 同样，如果必要的话，该基站收发信机系统要对从位于其小区内的无线设备102 接收的任何通信信号进行解调和可能的解码和解密。 Also, if necessary, the base transceiver system for any communication signals received from wireless device 102 within its cell demodulates and possibly decodes and decrypts. 通信协议和参数可以在不同的网络之间改变。 Communication protocols and parameters may vary between different networks. 例如，一个网络可以使用不同的调制方案并且以与其它网络不同的频率进行操作。 For example, a network may use a different modulation scheme and operate at different frequencies with other networks operate. 基础服务也可能基于其特定的协议修订版而有所不同。 Basic services may also be based on its particular protocol revision vary. 在图1的通信系统100中示出的无线链路表示一个或者多个不同的信道，通常为不同的射频（RF)信道和在无线网络104与无线设备102之间使用的相关协议。  represents one or more different channels, typically different radio frequency (RF) channels, and associated protocols used between wireless network 104 and wireless device 102 in the communication system 100 of FIG. 1 illustrating radio link . RF信道是必需要保存的受限资源，这通常是由于整个带宽的限制和无线设备102的受限的电池功率的原因。 RF channel is a limited resource will need to save, which is usually due to limited battery power 102 the entire bandwidth limitations and wireless devices. 本领域的普通技术人员应当理解，实践中的无线网络可以包括由所希望的整个网络覆盖范围区域而定的数百个小区。 Those skilled in the art will appreciate, in practice the network may include the entire wireless network coverage area may be hundreds of cells desired. 所有相关的部件都可以通过多个交换机和路由器（未示出）来连接，由多个网络控制器进行控制。 All parts are by multiple switches and routers (not shown) are connected, controlled by multiple network controllers. 对于由网络操作员登记的所有无线设备102来说，永久数据（诸如无线设备102 的用户简档（profile))以及临时数据（诸如无线设备102的当前位置）都存储在HLR/ AC138中。  For all wireless device 102 is registered by the network operator, permanent data (such as wireless device 102 user's profile (Profile)) as well as temporary data (such as the current location of wireless device 102) are stored in HLR / AC138 in. 在语音呼叫无线设备102的情况下，查询HLR/AC138来确定无线设备102的当前位置。 In case of a voice call to wireless device 102 queries HLR / AC138 to determine the current location of the wireless device 102. MSC130的访问位置寄存器（VLR)负责一组位置区域，并且存储当前处于其负责区域内的这些无线设备的数据。 MSC130 visitor location register (VLR) responsible for a group of location areas and stores the data in these wireless devices currently in its area of ​​responsibility. 为了更快的接入，MSC130的访问位置寄存器还包括已从HLR/ AC138发送到VLR的永久无线设备数据部分。 For faster access, the MSC 130 visitor location register further comprises from HLR / AC138 sent to the VLR of the permanent wireless device data portion. 然而，MSC130的VLR还可以分配并存储诸如临时标识符这样的本地数据。 However, VLR of MSC 130 may also assign and store a temporary identifier such as local data. 在系统接入方面，还要通过HLR/AC138来验证无线设备102。 In the system access, but also to verify that wireless device 102 via HLR / AC138. 为了向基于CDMA2000的网络中的无线设备102提供分组数据服务，RN128与TOSN132进行通信。 In order to provide packet data services to wireless device 102 in a CDMA2000-based network, RN128 communicate with TOSN132. PDSN132通过IP网络134提供到因特网144 (或者内部网、无线应用协议（WAP)服务器等）的接入。 PDSN132 provided through the IP network 134 to the Internet 144 (or intranets, Wireless Application Protocol (WAP) servers, etc.) of access. PDSN132还在移动IP网络中提供外部代理（FA)功能性以及用于虚拟专用网络互连的分组传送。 PDSN132 mobile IP network also provides foreign agent (FA) as well as packet transport for virtual private functional network interconnection. PDSN132具有IP地址的一个范围，并且执行IP地址管理、会话保持以及可选的超高速缓存。 PDSN132 has a range of IP addresses and performs IP address management, session remains and optional cache. RADIUS服务器136负责执行与分组数据服务的验证、授权和计费(AAA)相关的功能，而且还可以称之为AAA服务器。 Authentication, authorization, and accounting (AAA) functions related to RADIUS server 136 is responsible for performing packet data services, but also referred to as an AAA server. 本领域的普通技术人员应当理解，无线网络104还可以连接到其它的系统，可能包括其它的网络，但没有在图1中明确示出。  Those skilled in the art will appreciate, the wireless network 104 may also be connected to other systems, possibly including other networks, but does not explicitly shown in FIG. 即使不存在实际交换的分组数据，网络通常也会继续发送至少某种寻呼以及系统信息。 Even if the actual switched data packet does not exist, the network will continue to transmit at least some generally paging and system information. 尽管网络由许多部分组成，但所有这些部分会共同工作从而导致在无线链路上出现某种行为。 Although the network consists of many parts, but all these parts will work together in order to cause a certain behavior on the radio link. 图2是图1的优选无线设备即移动台202的更加详细的框图。  FIG. 2 is a more detailed block diagram of a preferred wireless device of FIG 1, i.e. the mobile station 202. 移动台202优选的是具有至少语音和包含与其它计算机系统进行通信的能力的高级数据通信能力的双向通信设备。 Mobile station 202 is preferably a two-way communication device with advanced data communication capabilities and comprising at least voice capability to communicate with other computer systems. 根据移动台202所具有的功能性，可以将移动台202称为数据消息发送设备、双向寻呼机、具有数据消息传递能力的蜂窝电话、无线因特网设备或者数据通信设备（具有或者不具有电话能力）。 The functionality of mobile station 202 has, the mobile station 202 may be referred to as a data messaging device, a two-way pager, a cellular telephone with data messaging, a wireless Internet appliance or a data communication device transmission capacity (with or without telephony capabilities). 如图2所示，移动台202适合于与WLAN190进行无线通信。  2, the mobile station 202 is adapted to wirelessly communicate with WLAN190. 同样还示出，移动台202可以适合于与蜂窝基站收发信机系统200进行无线通信。 Also shown, the mobile station 202 may be adapted to wirelessly communicate with cellular base station transceiver system 200. 对于与蜂窝网络进行的通信来说，移动台202利用通信子系统211。 For communication with cellular networks, mobile station 202 utilizes communication subsystem 211. 对于与WLAN进行的通信来说，移动台202利用附加的通信子系统291，其具有与通信子系统211相同的结构组成部件。 For communication with the WLAN, the mobile station 202 utilizes an additional communication subsystem 291, communication subsystem 211 having the same configuration components. 可以将具有这种配置的移动台202称为"双模"移动站。 The mobile station may be 202 having such a configuration is called "dual mode" mobile station. 尽管在图2中示出的移动台202具有分开且独立的子系统，但至少上述子系统的某些部分或部件（换言之不同的子系统）在可能的情况下可以共享。 Although shown in FIG. 2 mobile station 202 having separate and independent subsystems, at least some portion of the above subsystems or components (in other words different subsystems) in possible can be shared. 应当注意移动台202可以选择性的为不具有通信子系统211 (而宁可说是仅通过通信子系统291与WLAN190进行通信）的"单模"移动站。 It should be noted that the mobile station 202 may selectively not have communication subsystem 211 (but rather only communicate through communication subsystem 291 with WLAN190) "single mode" mobile station. 通信子系统211包括接收机212、发射机214、和诸如一个或者多个（优选地被嵌入或者在内部）天线元件216和218这样的相关部件，本地振荡器（LO) 213和诸如数字信号处理器（DSP) 220这样的处理模块。  The communication subsystem 211 includes a receiver 212, a transmitter 214, and such as one or more (preferably embedded or internal) antenna elements 216 and 218 associated components such as, a local oscillator (LO) 213, and such a digital signal processor (DSP) 220 of such a processing module. 通信子系统211类似于图1中示出的RF收发信机电路108a和天线110a。 Communication subsystem 211 is similar to FIG. 1 shows an RF transceiver circuitry 108a and antenna 110a. 对通信领域的普通技术人员来说显而易见的是，特定的通信子系统211的设计取决于移动台202试图在其中运行的通信网络。 One of ordinary skill in the art it will be apparent that communication, the particular design of communication subsystem 211 depends on the mobile station 202 is attempting to run within the communication network. 在所需的网络过程完成之后，移动台202可以通过网络来发送和接收通信信号。  After the desired network is complete, the mobile station 202 may send and receive communication signals over the network. 天线216通过网络接收的信号被输入到接收机212,该接收机212可以执行诸如信号放大、 下变频、滤波、信道选择等的通用接收机功能，而且在图2示出的实例中，还可以进行模数(A/D)转换。 Antenna 216 is input to the signal received by the network to the receiver 212, the receiver 212 can perform functions such as signal amplification, frequency down conversion, filtering, channel selection, etc. The general functions of the receiver, and in the example shown in FIG. 2, may also be analog to digital (A / D) conversion. 接收信号的A/D转换允许更加复杂的通信功能，诸如在DSP220中执行解调和解码。 A / D conversion of a received signal allows more complex communication functions such as demodulation and decoding performed in the DSP220. 以类似的方式，对要被发送的信号进行处理，例如包括通过DSP220进行调制和编码。 In a similar manner, signals to be transmitted are processed, including modulation and encoding for example, by the DSP220. 这些经DSP处理的信号被输入到发射机214,以便进行数模（D/A)转换、上变频、滤波、放大并经由天线218在通信网络上传输。 These DSP-processed signals are input to transmitter 214 for digital to analog (D / A) conversion, frequency up conversion, filtering, amplification and transmission over the communication network 218 via the antenna. DSP200不仅处理通信信号，而且还向接收机和发射机提供控制。 DSP200 not only processes communication signals, but also provides for receiver and transmitter to control. 例如，可以通过在DSP220中实施的自动增益控制算法来自适应地控制应用于接收机212和发射机214中的通信信号的增益。 For example, in the embodiment through automatic gain control algorithms DSP220 adaptively controlling the gain applied to communication signals in receiver 212 and transmitter 214. 网络接入与移动台202的订户或用户相关联，因此移动台202需要诸如订户识别模块即"snr卡、通用s頂(u-sm或者可拆卸的用户识别模块（R-sm这样的存储器模块262,该存储器模块262被插入或连接到移动台202的接口264,以便在网络中进行操作。由于移动台202是一种移动式电池供电设备，所以其还包括用于接收一个或者多个可拆卸电池256的电池接口254。这种电池256如果不是向移动台202中的所有电路供电，就向其中的大部分电路供电，而且电池接口254提供与电池256的机械和电连接。电池接口254与向所有电路提供电源V+的调整器（未在图2中示出）相连。  Network access is associated with a subscriber or user mobile station 202, and therefore mobile station 202 requires a Subscriber Identity Module, such as i.e. "snr cards, universal s top (u-sm or removable user identity module (R-sm so a memory module 262, the memory module 262 is inserted in or connected to an interface 264 of mobile station 202, in order to operate in the network. Since the mobile station 202 is a mobile battery-powered device, it further comprises means for receiving one or a plurality of detachable battery 254. the battery interface 256. such a battery 256, if not all circuitry in mobile station 202, wherein the most part of the circuitry, the battery and the battery interface 254 provides a mechanical and electrical connection 256. and battery interface 254 provides power V + to the regulator (not shown in FIG. 2) is connected to all of the circuitry. 移动台202包括控制移动台202的整体操作的微处理器238 (其是图1的控制器106的一种实现方式）。  The mobile station 202 includes the mobile station 202 controls the overall operation of the microprocessor 238 (FIG. 1 which is the controller 106 of one implementation). 这种控制包括本发明的无线广播信息处理技术。 This control comprises a wireless broadcast information processing techniques of the present invention. 通过通信子系统211来执行至少包括数据和语音通信的通信功能。 Through communication subsystem 211 performs communication functions including at least data and voice communications. 微处理器238还与附加的设备子系统进行交互作用，这些设备子系统诸如显示屏222、闪存224、随机访问存储器（RAM) 226、诸如输入/输出（I/O)子系统228、串行接口230、键盘232、扬声器234、麦克风236、近程通信子系统240以及通常以242指明的任何其它设备子系统。 Microprocessor 238 also interacts with additional device subsystems such as the display device subsystems 222, flash memory 224, random access memory (RAM) 226, such as input / output (I / O) subsystems 228, a serial interface 230, a keyboard 232, a speaker 234, a microphone 236, short-range communications subsystem 240, and 242 generally indicate any other device subsystems. 图2中示出的某些子系统执行与通信相关的功能，而其它的子系统可以提供"驻留"或者设备上的功能。 FIG. Some of the subsystems shown perform communication-related functions 2, whereas other subsystems may provide "resident" or on-device functions. 值得注意的是，例如，诸如键盘232和显示屏222的某些子系统既可用于诸如输入用于基于通信网络进行传输的文本消息这样的与通信相关的功能，又可用于诸如计算器或者任务列表这样的驻留设备的功能。 It is noted that, for example, certain subsystems such as keyboard 232 and display 222 are used as input for both communication-related functions such as text message for transmission on a communication network, such as a calculator or task but also for this list of features reside equipment. 由微处理器238使用的操作系统软件优选地被存储到诸如闪存224这样的永久存储器中，该闪存224选择性地可以是只读存储器（ROM)或者类似的存储元件（未示出）。 Operating system software used by microprocessor 238 is preferably stored in the flash memory 224 such as persistent memory, the flash memory 224 may optionally be a read only memory (ROM) or similar storage element (not shown). 本领域的普通技术人员应当理解，操作系统、特定设备的应用程序或其部分可以被临时加载到诸如RAM226这样的易失性存储器中。 Those skilled in the art will appreciate, the application operating system, specific device or portions thereof may be temporarily loaded into a volatile such as RAM226 memory. 除了其操作系统功能外，微处理器238优选地能够执行有关移动台202的软件应用程序。  In addition to its operating system functions, preferably the microprocessor 238 enables execution of software applications 202 relating to the mobile station. 用于控制基本设备操作，包括至少数据和语音通信应用程序的预先确定的应用程序集通常在生产移动台202期间就被安装到其上。 For controlling basic device operations, including at least data and voice communication applications a predetermined set of applications is usually produced during the mobile station 202 to be mounted thereon. 可以被加载到移动台202上的一个优选应用程序可以是个人信息管理器（PM)应用程序，该应用程序具有组织和管理与用户相关的数据项的能力，诸如但不限于电子邮件、日历事件、语音邮件、约会和任务项目。 Can be loaded onto the mobile station 202 is a preferred application may be a personal information manager (PM) application, the application having the ability to organize data items relating to the user and management, such as, but not limited to, email, calendar events , voice mails, appointments, and task items. 自然地， 在移动台202和S頂256上的一个或者多个存储器可用于方便存储P頂数据项和其它信息。 Naturally, one or more memory on the mobile station 202 and S 256 may be used to facilitate a top P top storing data items and other information. PM应用程序优选地具有经由无线网络发送和接收数据项的能力。  PM application preferably has the ability to send and receive via a wireless network data items. 在优选实施方式中，利用所存储的和/或与主计算机系统相关联的无线设备用户的对应数据项，经由无线网络来无缝地集成、同步和更新PM数据项，从而就这些项目来说在移动台202上创建镜像主机。 In a preferred embodiment, the utilization and / or the wireless device user's corresponding data items to the host computer system associated with the stored seamlessly integrated via the wireless network, PM data item synchronized and updated, so that these projects creating a mirrored host computer on mobile station 202. 对于主计算机系统为无线设备用户的办公计算机系统，这有特别的好处。 For the main computer system is the wireless device user's office computer system, which has a special advantage. 还可以通过网络、辅助I/O子系统228、串行端口230、近程通信子系统240或者任何其它合适的子系统242将附加的应用程序加载到移动台202上，并且由用户安装到RAM226或者优选地安装到非易失性存储器（未示出）中，以便由微处理器238来执行。 Also through network, an auxiliary I / O subsystem 228, serial port 230, short-range communications subsystem 240 or any other suitable subsystem 242 additional application loaded onto the mobile station 202, and installed by a user RAM226 or preferably mounted to the non-volatile memory (not shown) for execution by microprocessor 238. 这种应用程序安装过程中的灵活性增加了移动台202的功能性，并且可以提供增强的设备上的功能、与通信相关的功能或者二者。 This application flexibility during installation increases the functionality of mobile station 202 and may provide enhanced on-device functions, communication-related functions, or both. 例如，安全通信应用程序可以使得能够通过使用移动台202来执行电子商务功能和其它这样的金融交易。 For example, secure communication applications may enable electronic commerce functions and to perform other such financial transactions using the mobile station 202. 在数据通信模式中，将通过通信子系统211来处理诸如文本消息、电子邮件消息或者网页下载这样的接收信号，并且输入到微处理器238中。  In a data communication mode, will be processed by communication subsystem 211 such as a text message, an email message or web page download such a reception signal, and input to the microprocessor 238. 微处理器238将优选地进一步处理用于输出到显示屏222或者可选择地输出到辅助I/O设备228的信号。 Microprocessor 238 will preferably further process for outputting a signal to the display 222 or the auxiliary I / O device 228 to selectively output. 移动台202 的用户还可以例如通过使用键盘232结合显示屏222,而且可能的话结合辅助I/O设备228 来编辑诸如电子邮件消息这样的数据项。 User of mobile station 202 may also be, for example, by using the keyboard 232 in conjunction with display 222 and possibly in conjunction with an auxiliary I / O device 228 such as an email message to edit such data items. 键盘232优选地是一种完全数字字母键盘和/或电话类型键盘。 Keyboard 232 is preferably a complete alphanumeric keyboard and / or telephone-type keypad. 这些编写的项目可以经由通信子系统211基于通信网络进行发送。 These composed items may be transmitted on the communication network 211 via the communication subsystem. 对于语音通信来说，除了所接收的信号被输出到扬声器234且用于传输的信号通过麦克风236产生之外，移动台202的整个操作实际上都是类似的。  For voice communications, in addition to the received signal 234 is outputted to a speaker and a signal for transmission is generated by a microphone 236 outside the overall operation of mobile station 202 are actually similar. 诸如语音消息记录子系统这样的可选择语音或者音频I/O子系统还可以在移动台202上实现。 Such as a voice message recording subsystem, such alternative voice or audio I / O subsystem may also be implemented on mobile station 202. 尽管优选地首先通过扬声器234来实现语音或者音频信号输出，但是作为某些示例，还可以使用显示屏222 来提供有关呼叫方身份、语音呼叫持续时间或者其它与语音呼叫相关的信息的指示。 Although it is preferred to first voice or audio signal output through the speaker 234, but as some examples, display 222 may also be used to provide information about the identity of a calling party, duration of a voice call, or other related information, the voice call. 虽然个人数字助手（PDA)类型的通信设备是可选择的部件，但是图2中的串行端口230通常在希望与用户桌上型计算机同步的个人数字助手（PDA)类型的通信设备中实现。  Although the personal digital assistant (PDA) type communication device is optional component, but in FIG. 2 serial port 230 is typically a desktop computer with a user desired a personal digital assistant synchronization (PDA) type communication device implemented. 串行端口230能够使用户通过外部设备或者软件应用程序来设置优先等级，并且通过提供下载到移动台202的信息或者软件（不是通过无线通信网络）来扩展移动台202的能力。 Serial port 230 enables a user to set the priority level through an external device or software application, and the information or software downloads to mobile station 202 (not through a wireless communication network) to extend the capabilities of mobile station 202 by providing. 可替换的下载路径例如可用于通过直接的且可靠和可信的连接将加密密钥加载到移动台202上，从而提供安全的设备通信。 Alternate download path may be used, for example, through a direct, reliable and trusted connection to load an encryption key onto mobile station 202, to provide secure device communication. 图2中的近程通信子系统240是为在移动台202和不同的系统或者设备（不必是类似的设备）之间进行通信而提供的附加的可选部件。 Short-range communications subsystem 240 is an additional optional component is a communication between mobile station 202 and different systems or devices (not necessarily be similar devices) provided in  FIG. 例如，子系统240可以包括红外设备和相关的电路和部件，或者为与相似的启用系统和设备进行通信所提供的Bluetooth™ 通信模块。 For example, subsystem 240 may include an infrared device and associated circuits and components, or a Bluetooth ™ communication module to communicate with a similar enabled systems and devices are provided. Bluetooth™是Bluetooth SIG有限公司的注册商标。 Bluetooth ™ is a registered trademark of Bluetooth SIG Corporation. 图3是示出了包含无线局域网（WLAN)304、蜂窝电信网络306、308和310以及WLAN 启用无线设备300和320的通信系统的框图。  FIG. 3 is a block diagram illustrating a wireless local area network comprising (WLAN) 304, cellular telecommunication networks 306, 308 and 310, and WLAN-enabled wireless devices 300 and 320 of the communication system. WLAN启用无线设备300和302可以具有结合图1和图2所描述的结构和操作。 WLAN-enabled wireless devices 300 and 302 may have 2 and described in conjunction with FIG. 1 structure and operation. 应当注意除了这里所示出的之外，在通信系统中还提供由更多的无线设备、WLAN和蜂窝网络。 It should be noted that in addition to the illustrated here, in a communication system is also provided by the additional wireless devices, WLAN and cellular networks. 正如所示出的，WLAN304与一个或者多个蜂窝网络306、308和310相连。 As shown, WLAN304 with one or more cellular networks 306, 308 and 310 are connected. WLAN304通过有线连接或者其它合适的方式（例如，经由T1/E1连接或者点对点无线电链路）从蜂窝网络306、308和310接收信息。 WLAN304 via a wired connection or other suitable means (e.g., via a T1 / E1 or point to point radio link) from the cellular network 306, 308 and 310 receive information. WLAN可以放置在任何合适的区域或者环境中，而且通常可以在咖啡屋、餐厅、宾馆、机场和公司办公室中找到。 WLAN can be placed in any suitable area or environment, and can usually be found in coffee shops, restaurants, hotels, airports and corporate offices. 可以将WLAN提供覆盖范围内的区域称为"热点（hot spot) "。 WLAN may be provided within a coverage area called a "hot spot (hot spot)". 无需设备300和302基于射频(RF)通信链路在WLAN304内或者通过WLAN304进行无线通信。 No device 300 and 302 based on radio frequency (RF) communication link or by wireless communication in WLAN304 WLAN304. WLAN通常使用传统的电话公司的连接与因特网有线相连，以便为无线设备300和302提供更高带宽的数据通信。 WLAN typically uses a connector connected to a conventional wired telephone company and the Internet, to provide higher bandwidth data communications for wireless devices 300 and 302. 例如，WLAN304根据IEEE或者ETSI标准来运行，尽管WLAN304可以利用任何合适的通信技术。 For example, it operates according to IEEE WLAN304 or ETSI standards, although WLAN304 using any suitable communication technology. 图4是示出了用于规定在WLAN和无线设备之间的蜂窝网络信息的传递方法的流程图。  FIG 4 is a flowchart illustrating a method of transmitting cellular network information between a WLAN and a predetermined wireless device. 该方法可以在图3所描述的环境中、利用图1和2所示出并描述的无线设备来执行。 The method may be described in the context of FIG. 3, the use shown and described in FIGS. 1 and 2 the wireless device is performed. 通过一个或者多个无线设备的控制器或者处理器（例如图2的微处理器238)、结合任何其它必要的设备部件（例如其RF收发信机）来执行该方法的步骤。 One or more wireless devices by a controller or processor (e.g. microprocessor 238 of FIG. 2), in combination with any other necessary device components (e.g. its RF transceivers) to perform the steps of the method. 根据说明书可以显而易见的是，WLAN执行与无线设备的方法相关联的一种附带的（complimentary)方法。 The instructions may be apparent that a method for performing wireless WLAN device associated with the supplied (complimentary) method. 本发明的计算机程序产品可以包括存储介质（例如，图2的FLASH存储器224)和在存储介质中存储的计算机指令，这些指令通过所述一个或者多个用于执行该方法的处理器来执行。 The computer program product of the present invention may include a storage medium (e.g., FLASH memory 224 of FIG. 2) and computer instructions stored in the storage medium, the instructions executed by the one or more processors for performing the method. 以图4的开始框402开始，无线设备使用其RF收发信机来执行扫描操作，以识别在覆盖范围内的任何可用的WLAN(图4的步骤404)。  begins with start block 402 of FIG. 4, the wireless device uses its RF transceiver to perform the scanning operation to identify any available WLAN (step 404 of FIG. 4) within the coverage area. 在该步骤中，无线设备扫描所有可用的频带（例如，2. 4千兆赫，5千兆赫，或者二者），以识别在其当前位置可用的所有可能的WLAN。 In this step, the wireless device scans all available bands (e.g., 2.4 GHz, 5 GHz, or both) to identify all possible available WLAN its current location. 假定识别出至少一个WLAN，该无线设备选择其中一个WLAN并且使用其RF收发信机监控来自所选WLAN的广播信息。 Assuming identifying at least one WLAN, the wireless device selects a WLAN using its RF transceiver to monitor broadcast information from the WLAN selected. 一旦监控到，无线设备就从WLAN接收广播信息（图4的步骤406)。 Once the monitoring, the wireless device can receive broadcast information (step 406 in FIG. 4) from the WLAN. 由WLAN规则地或者周期性地向着所有兼容的无线设备广播该广播信息，优选地是以一个预先确定的重复率来进行。 Periodically towards all compatible wireless device broadcasts the broadcast information, the repetition rate is preferably determined to a predetermined rule or by WLAN. 特别是，可以在称为"信标帧"的一个规则广播的帧内发送广播信息。 In particular, the broadcast information may be sent in a regular broadcast frame called "beacon frame". 这些帧包括用于指示它们是否为广播帧的首部信息。 These frames include header information for indicating whether or not they are broadcast frames. 广播信息可以包括称为"普通容器消息"的信息。  The broadcast information may include information called "normal container message" in. 普通容器消息包括与所有可用于WLAN的蜂窝网络（例如可用于图3的WLAN304的蜂窝网络306、308和310)相关联的蜂窝网络广播信息。 Common to all container message includes cellular network may be used for the WLAN (for example, for a cellular network in FIG. 3 WLAN304 306, 308 and 310) the cellular network broadcast information associated. 根据其名称就可以显而易见的看出，普通容器消息并不是一种特定的技术或者标准，其可以包括来自多个不同蜂窝网络（例如3GPP、3GPP2或者其它合适的标准） 中的任何一个或者多个的网络广播信息。 Can be seen according to their apparent name, common container message is not technology or a specific standard, which may include any one or more of a plurality of different from a cellular network (e.g. 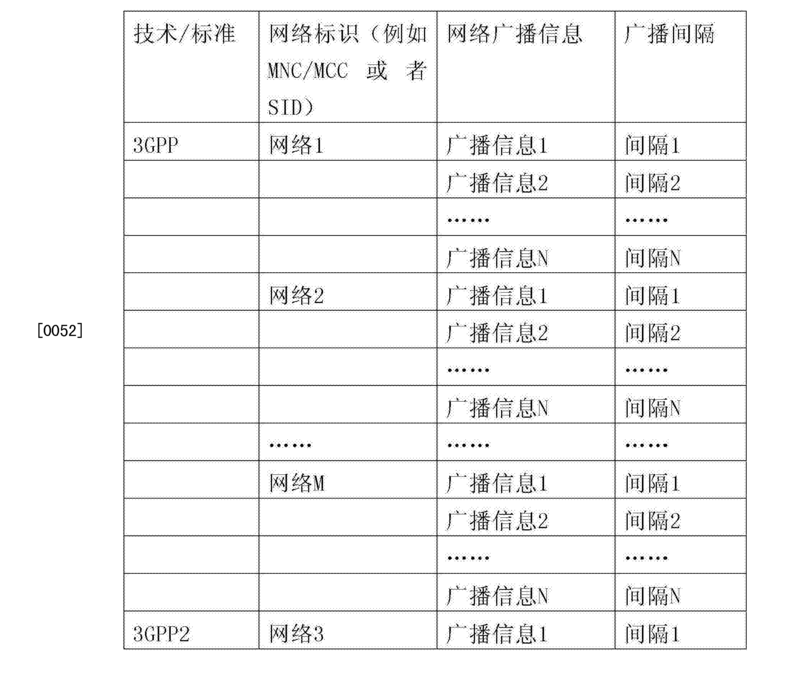 3GPP, 3GPP2, or other suitable standard) of the network broadcast information. 当可以从与不同的蜂窝技术和/或标准相关联的网络接收信息时，在普通容器消息中的信息可以在内容和格式上根据与网络相关联的一个或者多个蜂窝标准而改变。 As it may be different cellular technologies and / or receiving information, the information in an ordinary container message may vary in a standard network associated with the content and format in accordance with one or more associated network from the cellular standards. 例如，蜂窝格式可以基于第三代伙伴计划（3GPP)和/或第三代伙伴计划2 (3GPP2)，和/或任何其它的蜂窝或者无线网络标准。 For example, the cellular format may be based on Third Generation Partnership Project (3GPP) and / or Third Generation Partnership Project 2 (3GPP2), and / or any other cellular or wireless network standards. 通过合适的标识符，诸如技术或者组织标识符对一般消息容器中的特定技术信息进行标识。 , Such as a technology or organization identifier for certain technical information message container ships identified by an appropriate identifier. 因此，WLAN可以接收具有由两个或者多个不同的蜂窝标准和/或通信协议定义的内容和格式的网络广播信息。  Thus, WLAN may receive a different cellular standards and / or network information by two or more content formats and communication protocols defined. 蜂窝网络广播信息可以包括通常由相关蜂窝网络或者（可选择的）其子集广播的所有信息。 The cellular network broadcast information may include all information typically a cellular network or by the relevant (optional) broadcasts its child sets. 优选地，在其它的信息中，蜂窝网络信息包括具有唯一标识蜂窝网络的信息的广播信息。 Preferably, the additional information, the information comprises cellular network broadcast information having information that uniquely identifies a cellular network. 例如，该唯一标识（identify)蜂窝网络的信息可以包括系统标识符（SID)和/或移动国家代码（MCC)和移动网络代码（MNC)对。 For example, the unique identification information (the Identify) cellular network may include a system identifier (SID), and / or a mobile country code (MCC) and Mobile Network Code (MNC) pair. WLAN最初从可用蜂窝网络或者一个或者多个网络数据库接收该信息，并且将该信息提供或者格式化为普通容器消息。  WLAN initially receives this information from the available cellular networks or one or more network databases, and provides or formats the information message to the conventional case. 优选地，按照技术、网络和内容的组织方式（例如参见下面的表1)对蜂窝网络信息进行存储。 Preferably, in accordance with the technical organization, network, and content (see e.g. Table 1 below) of the cellular network information is stored. 表1。  Table 1. 一个有组织地在WLAN中存储网络广播信息的实例；还是一个通常由WLAN来发送普通容器消息中的蜂窝网络信息的顺序的例子；而且还是一个在无线设备中有组织地存储蜂窝网络信息的例子。 Examples organized in a WLAN network broadcast information in memory; is typically a cellular network to transmit an order of information in the conventional case of a WLAN message; but also an example of the organized storage of cellular network information in the wireless device . 应当注意，普通容器消息可以选择性地或者额外地包括来自任何可用于WLAN的无线网络的无线网络广播信息（与蜂窝网络广播消息相对照）。  It is noted that the ordinary container message may alternatively or additionally include wireless network broadcast information from a wireless network can be used for any of the WLAN (in contrast to cellular network broadcast message). 例如，普通容器消息可以包括与一个或者多个按照Wi-MX技术运行的可用无线网络相关联的无线网络广播信息。 For example, ordinary container message may include a plurality of information according to a wireless network or Wi-MX broadcast technology available wireless networks operating associated. Wi-MX是基于IEEE802. 16空中接口标准的技术，该标准用于使用点对多点（PMP)结构的固定无线宽带接入系统。 Wi-MX is based on IEEE802. 16 air interface standard in the art, the standards for fixed wireless broadband access systems using point to multipoint (PMP) structure. 如果来自WLAN的广播信息包括普通容器消息，则无线设备就接收并解码该普通容器消息，从而揭示包含在其中的网络广播信息（图4的步骤408)。  If the broadcast information from the WLAN includes a common container message, the wireless device can receive and decode the message ordinary container so as to reveal the network broadcast information contained therein (step 408 in FIG. 4). 然后，该无线设备将该信息存储到其存储器中，优选地以上述表1示出并描述的有组织的方式。 Then, the wireless device stores the information into its memory, preferably in the above Table 1 is shown and described in an organized fashion. 从而，无线设备存储用于多种不同类型的、无线设备可以与之互连的网络的可用网络广播信息。 Thus, the wireless device stores a plurality of different types of wireless devices may be interconnected with the network available network broadcast information. 优选地，无线设备在非易失性存储器中保持该信息，以使得如果该无线设备处于关闭状态仍然保持该信息。 Preferably, the wireless device maintains the information in non-volatile memory, such that if the wireless device remains in the closed state of the information. 应当注意，针对无线设备遇到的每个WLAN都要存储这样的信息。  It should be noted that each WLAN encountered by the wireless device must store such information. 在无线设备存储器中，建立一种关系，即在无线设备遇到的各个WLAN(例如优选地基于SSID)和从该WLAN 接收的可用蜂窝网络信息之间的关系。 In the wireless device memory, to establish a relationship, i.e. each WLAN encountered by the wireless device (e.g. preferably based on the SSID) of the WLAN and received from the relationship between the information available cellular networks. 还应当注意，广播信息还可以包括与各个网络相关的广播间隔数据。 It should also be noted that the broadcast information may also include broadcast interval data associated with each network. 该间隔数据是对信息进行广播所采用的间隔的指示；间隔数据用于计算广播的重复率。 The interval data is indicative of a broadcast interval information used; broadcast interval data is used to calculate the repetition rate. 参照上述表1，3GPP信息具有从1到η的广播信息和从1到η的相关间隔数据。 Referring to the table from the broadcast information having information 1,3GPP 1 to η and associated interval data from 1 to η is. 同样，独立的容器存储有具有广播信息1到η的3GPP2信息和从1到η的相关间隔数据。 Similarly, a separate container stores 3GPP2 Information having broadcast information 1 to η and associated interval data from 1 to η is. 如果存在多个根据先前扫描操作（图4的步骤410)标识的WLAN，则无线设备重复用于每个这种WLAN的步骤。  If there are a plurality of the previous scanning operation (step 410 of FIG. 4) WLAN identified, then the wireless device repeats the steps for each such WLAN's. 如果不存在，则该无线设备请求（solicit)可以在"秘密模式" 中运行的已知的WLAN。 If not, the wireless device requests (a Solicit) known in WLAN operating in the "secret mode". 当在秘密模式中运行时，WLAN制止向无线设备广播其SSID。 When operating in stealth mode when, WLAN wireless device to stop broadcasting its SSID. 无线设备可以使用WLAN的服务集标识符（SSID)、利用"探查请求"来请求这样的WLAN。 The wireless device may use the WLAN Service Set Identifier (SSID), request such a WLAN using the "Probe Request." 因此， 无线设备可以向WLAN发送一个针对WLAN的已知的已存储SSID的探查请求（图4的步骤414)。 Accordingly, the wireless device may send a probe request to the WLAN for a known stored SSID (step 414 of FIG. 4) to the WLAN. WLAN通常应当利用由无线设备接收的探查相应与无线设备通信（图4的步骤415)。 WLAN should normally received by the wireless device using the respective probe (step 415 of FIG. 4) communicating with the wireless device. 如果网络的交互工作得到WLAN的支持，则WLAN将其探查响应中的普通容器消息（如上所述）返回给无线设备（图4的步骤416)。 If network interworking is supported by the WLAN, the WLAN ordinary container message (as described above) which returns the probe response to the wireless device (step 416 of FIG. 4). 正如上面早些所描述的，通过无线设备来接收、解码并存储该普通容器消息。 As described earlier above, the wireless device receives, decodes and stores the message ordinary container. 如果网络交互工作得不到WLAN的支持，则不执行步骤416。 If the network interworking WLAN is not supported, step 416 is not performed. 接下来，如果存在针对探查请求考虑的额外存储的SSID (图4的步骤418)，则为了探查附加的WLAN，该无线设备重复步骤414、415和416。 Next, if there are additional storage for probe request consider the SSID (step 418 of FIG. 4), the probe for additional WLAN, the wireless device repeats steps 414, 415 and 416. 此后，无线设备选择并登记到所选WLAN上（图4的步骤412)。  Thereafter, the wireless device selects and registers onto a selected WLAN (step 412 of FIG. 4). 这将使得无线设备和WLAN能够进行通信（图4的步骤420)。 This will enable the wireless device and the WLAN (step 420 of FIG. 4) is capable of communication. 然后，无线设备在接收网络广播信息之后，可以执行网络选择，以便与根据普通容器消息标识的其中一个网络进行通信。 Then, the wireless network device after receiving the broadcast information, network selection may be performed to communicate with the identified message in accordance with the conventional case wherein a network. 特别是，无线设备可以利用蜂窝网络信息中的MCC/MNC对（或者SID)来执行网络选择。 In particular, the wireless device may utilize the cellular network information MCC / MNC is performed on (or SID) Network selection. 无线设备可以通过WLAN来选择这些网络中的其中一个（例如，根据优选网络列表或者通过经由用户接口的手动选择来选择其"本地"或者其它网络）。 The wireless device may select one of these networks by a WLAN (e.g., according to a preferred network list or through manual selection of a user interface to select its "local" or via other network). 特别是，无线设备使用网络接入标识符（NAI)用信号来通知WLAN所选的网络。 In particular, the wireless device using a network access identifier (NAI) signal to notify the selected WLAN network. 对于蜂窝网络选择来说，这代替了传统的无线设备的扫描操作。 Selection for a cellular network, it replaces the conventional scanning operation of the wireless device. 应当注意，在图4的步骤408中，无线设备可以不接收来自WLAN的广播信息中的任何普通容器消息。  It should be noted that in step 408 of FIG. 4, the wireless device may not receive any generic container message in the broadcast information from the WLAN. 相反，该无线设备可以接收用于表示来自WLAN的网络广播信息是否可用的网络交互工作指示符（例如位标志）。 Instead, the wireless device can receive broadcast information from the WLAN network representing whether the available network interworking indicator (e.g., flag). 无线设备基于该指示符来作出执行针对WLAN的探查请求的决定。 Wireless devices to make decisions on the implementation of the probe requests WLAN based on this indicator. 特别是，如果该指示符表示来自WLAN的网络广播信息可用（例如位标志=" 1"），则无线设备使用其SSID执行针对WLAN的探查请求；如果该指示符表示来自WLAN 的网络广播信息不可用（例如位标志= "〇"），则无线设备制止执行针对WLAN的探查请求。 In particular, if the indicator indicates that the network broadcast information is available from the WLAN (e.g. bit flag = "1"), the wireless device performs a probe request using its SSID for the WLAN; if the indicator indicates the broadcast information from the WLAN network is not available with (e.g. bit flag = "square"), then the wireless device performs a probe request for suppression of the WLAN. 因此，该申请的WLAN适合于从一个或者多个可用蜂窝网络或者网络数据库接收与该一个或者多个可用蜂窝网络相关联的蜂窝网络广播信息；在普通容器消息中提供蜂窝网络广播信息，该普通容器消息在内容和格式上按照与所述一个或者多个可用蜂窝网络相关联的一个或者多个蜂窝标准而变化；并且使该普通容器消息针对接收规则地进行广播， 并由无线设备使用。  Thus, WLAN is adapted to the application of the one or more available cellular network information associated with the cellular network receives from one or more available cellular networks or a network database; providing the cellular network broadcast information in a common container message , in accordance with the ordinary container message varies in content and format of the one or more cellular standards with the one or more available cellular networks associated; and makes the ordinary container for receiving a message regularly broadcast by the wireless device use. 另一方面，该申请的无线设备包括一个或者多个处理器；与该一个或者多个处理器相连的存储器；与该一个或者多个处理器相连的射频（RF)收发信机；以及与该RF收发信机相连的天线。 On the other hand, the application of the wireless device includes one or more processors; memory coupled to the one or more processors; with the one or more processors coupled to the radio frequency (RF) transceiver; and the RF transceiver connected to an antenna. 无线设备的一个或者多个处理器使用RF收发信机、可操作地监控来自无线局域网的广播信息；接收由无线局域网规则地进行广播的普通容器消息，所述普通容器消息包括与一个或者多个可用蜂窝网络相关联的蜂窝网络广播信息，该普通容器消息在内容和格式上按照与所述一个或者多个可用蜂窝网络相关联的一个或者多个蜂窝标准而变化；解码所述普通容器消息，以标识与所述一个或者多个可用蜂窝网络相关联的蜂窝网络广播信息；并且将所述蜂窝网络广播信息存储到存储器中。 The wireless device one or more processors to use RF transceiver, operable to monitor the broadcast information from a wireless local area network; Normal Normal container message received container message by the WLAN broadcast regularly, said comprising one or more available cellular network information associated with the cellular network, the message is changed in accordance with the conventional case with the one or more one or more cellular standards associated with the available cellular networks in content and format; decoding the message ordinary container, to identify the one or more available cellular network information associated with the cellular network; and the cellular network broadcast information stored in the memory. 作为选择，该申请的WLAN适合于从一个或者多个可用蜂窝网络或者网络数据库接收与该一个或者多个可用蜂窝网络相关联的蜂窝网络广播信息；在普通容器消息中提供蜂窝网络广播信息，该普通容器消息在内容和格式上按照与所述一个或者多个可用蜂窝网络相关联的一个或者多个蜂窝标准而变化；从无线设备接收探查请求；并且响应所述探查请求使该普通容器消息发送到无线设备。  Alternatively, the WLAN application is adapted to the one or more available cellular network broadcast information associated with the cellular network receives from one or more available cellular networks or a network database; provides the cellular network broadcast message in the conventional case information message according to the conventional case with the one or more one or more cellular standards associated with the available cellular networks vary in content and format; receiving a probe request from a wireless device; and in response to the probe request that the ordinary container message to the wireless device. 该WLAN可以进一步适合于对网络交互工作指示符进行广播，其中网络交互工作指示符表示来自WLAN的蜂窝网络广播信息是否可用。 The WLAN may be further adapted to broadcast a network interworking indicator, where the network interworking indicator indicates cellular network broadcast information is available from the WLAN. 另一方面，无线设备包括一个或者多个处理器；与该一个或者多个处理器相连的存储器；与该一个或者多个处理器相连的RF收发信机；以及与该RF收发信机相连的天线。 On the other hand, the wireless device includes one or more processors; memory coupled to the one or more processors; RF transceiver connected to the one or more processors; and coupled to the RF transceiver antenna. 所述无线设备的一个或者多个处理器可操作地将探查请求发送到无线局域网；接收响应所述探查请求来自从无线局域网的普通容器消息，所述普通容器消息在内容和格式上按照与所述一个或者多个可用蜂窝网络相关联的一个或者多个蜂窝标准而变化；解码所述普通容器消息，以标识与所述一个或者多个可用蜂窝网络相关联的蜂窝网络广播信息；并且将所述蜂窝网络广播信息存储到无线设备的存储器中。 The wireless device one or more processors operable to send a probe request to the WLAN; receiving a response to the probe request from the wireless LAN from a general container message, the normal container message content and format in accordance with the said one or one or more cellular standards associated with the plurality of available cellular networks varies; decoding the normal container message to identify the one or more available cellular network information associated with the cellular network; and the said cellular network broadcast information stored in the memory of the wireless device. 所述一个或者多个处理器可进一步可操作地接收被广播的网络交互工作指示符，其中所述网络交互工作指示符用于表示来自无线局域网的蜂窝网络广播信息是否可用。 The one or more processors are further operable to receive a network interworking indicator to be broadcasted work, where the network interworking indicator for indicating the cellular network broadcast information is available from the wireless local area network. 图5是示出了有关无线设备的网络选择的框图。  FIG. 5 is a block diagram illustrating network selection on wireless devices. 使用网络选择器504和检测器模块510来执行网络选择。 Using a network selector 504 and a detector module 510 to perform network selection. 在该处理中涉及的其它模块可以包括：用户输入激励器模块502、 用户显示模块222、存储器元件506和508、发射机212以及接收机214。 Other modules involved in this process may include: a user input activator module 502, a user display module 222, the memory elements 506 and 508, the transmitter 212 and receiver 214. 一旦从WLAN接收到广播信息，接收机212就将该信息传递到检测器模块242。 Upon receiving the broadcast information from the WLAN, receiver 212 passes the information on to the detector module 242. 检测器模块242适合于检测WLAN是否具有网络交互工作能力。 Detector module 242 is adapted to detect whether the WLAN has network interworking capabilities. 一旦网络选择器504确定其具有在存储器元件508中存储的来自WLAN304的充分的信息，该网络选择器504就利用允许无线设备300在其中漫游的网络来使用在存储器元件506中存储的该信息。 Once network selector 504 determines that it has sufficient information from WLAN304 508 stored in the memory element, the network selector 504 will use allows the wireless device 300 in which a roaming network use the information stored in the memory element 506. 就蜂窝网络交互工作方面来说，存储器元件506可以是S頂或者US頂。 Interactive work on a cellular network, the memory element 506 may be a top or S US top. 然后执行在存储器元件508中与存储器元件506中的信息的比较。 Then a comparison of information in the memory element 506 and memory element 508. 一旦选择了一个网络，就将该网络经由用户显示屏222显示给用户。 Once a network selection, to the network user via a display screen 222 displayed to the user. 另一方面，如果允许用户执行手动网络选择，则所有可用的网络都将经由用户显示屏222显示给用户，而且用户能够使用用户输入激励器模块502来选择网络。 On the other hand, if users are allowed to perform manual network selection, all available networks are displayed via a user display 222 to the user, and the user can use the user input activator module 502 to select a network. 图6是用于WLAN启用无线设备的特定网络选择方法的更加详细的流程图。  FIG. 6 is a more detailed flow diagram for a particular network selection method for a WLAN-enabled wireless devices. 该方法可以在图3描述的环境中、利用图1-2示出并描述的无线设备来执行。 The method may be described in the context of FIG. 3, FIG. 1-2 illustrate the use of the wireless device performed and described. 通过无线设备的一个或者多个控制器或者处理器（例如图2的微处理器238)、结合任何其它必要的设备元件（例如其RF收发信机）来执行这些步骤。 Via one or more controllers or processors of the wireless device (e.g. microprocessor 238 of FIG. 2), in combination with any other necessary device components (e.g. its RF transceivers) to perform these steps. 从说明书中可以显而易见的看出，WLAN执行与无线设备方法相关联的附带的方法。 Apparent from the description can be seen, with the method associated with the wireless device performs WLAN RELATED. 本发明的计算机程序产品可以包括存储介质（例如， 图2的FLASH存储器224)和在存储介质中存储的计算机指令，这些指令通过所述一个或者多个用于执行这些方法的处理器来执行。 The computer program product of the present invention may include a storage medium (e.g., FLASH memory 224 of FIG. 2) and computer instructions stored in the storage medium, the instructions executed by the one or more processors to perform these methods. 图6的处理从步骤602开始，在步骤604,无线设备从WLAN接收广播信息。 Processing  FIG 6 is started from step 602, at step 604, the wireless device receives broadcast information from the WLAN. 无线设备确定在所述广播信息中是否存在普通容器消息（图6的步骤606)。 The wireless device determines whether the message is present in the conventional case the broadcast information (step 606 of FIG. 6). 如果在步骤606中不存在普通容器消息，则无线设备确定是否存在表示网络交互工作是否可用的、来自WLAN的标记（图6的步骤608)。 If the message does not exist in the conventional case step 606, the wireless device determines whether there is available an interworking network indicates, a mark from the WLAN (step 608 of FIG. 6). 如果网络交互工作标记在步骤608中存在，则网络选择器504 (图5)发出信号执行针对WLAN的探查请求（图6的步骤610)。 If the network interworking flag is present at step 608, network selector 504 (FIG. 5) performs signaling (step 610 of FIG. 6) for the probe request WLAN. 一旦完成探查请求，无线设备就确定是否接收到来自WLAN的一个探查响应（图6的步骤612)。 Once the probe request is completed, the wireless device determines (step 612 of FIG. 6) whether a probe response is received from the WLAN. 然而，如果网络交互工作标记在步骤608中不存在，则网络选择器504 (图5)在步骤616发出信号来执行探查请求。 However, if no network interworking flag is present at step 608, network selector 504 (FIG. 5) sends a signal at step 616 to perform a probe request. 然后，系统确定是否完成探查请求（图6的步骤618)。 The system then determines whether the probe request is completed (step 618 of FIG. 6). 如果在步骤618完成了探查请求，则该方法进入到步骤612。 If at step 618 the probe request is completed, the method proceeds to step 612. 如果在步骤618没有完成探查请求，则该方法进入到步骤614。 If the probe request is not completed at the 618 step, the method proceeds to step 614. 如果在步骤612处接收到探查响应，或者如果在步骤606存在普通容器消息，则该方法进入到步骤620,以便将来自普通容器消息的网络广播信息存储到存储器元件506 (图5)中。  If received at step 612 to the probe response, or if an ordinary container message is present in step 606, the method proceeds to step 620, in order from the network information stored in an ordinary container message to the memory element 506 (FIG. 5) in. 在存储之后，将用信号通知网络选择器504状态发生了变化（图6的步骤622)。 After storage, the change (step 622 of FIG. 6) with the signal selector 504 informs the network state. 传递该状态改变，以使得无线设备在步骤614中针对其它可用的WLAN进行扫描。 The transmission state change, so that the other wireless device to scan for available WLAN in step 614. 步骤618 (未完成探查请求）、612 (未接收到探查请求）和622 (用信号将状态通知给网络选择器）全部反馈到用于确定试图寻找其它WLAN的确定框（box) 614。 Step 618 (probe request is not completed), 612 (probe request not received) and 622 (signal to notify the state to the network selector) all reactions to try to find other means for determining the WLAN determination block (box) 614. 如果在步骤614中标识出存在其它的WLAN，则该方法返回到步骤604,针对下一个WLAN再次重复开始。 If there are other WLAN identified in step 614, the method returns to step 604, a repeat start again for the next WLAN. 如果在步骤614中没有发现其它的WLAN，则无线设备将所接收的信息与在存储器元件506和508中存储的信息进行比较（图6的步骤624)。  If no other WLAN in step 614, the wireless device with the received information (Step 624 in FIG. 6) in the information memory elements 506 and 508 are stored. 接下来，为无线设备标识手动的网络选择模式或者自动的网络选择模式（图6的步骤626)。 Next, the manual network selection mode wireless device identifier or automatic network selection mode (step 626 of FIG. 6). 如果在步骤626中标识了自动模式，则基于步骤624的比较结果、通过无线设备自动地选择用于通信的所希望的网络(图6的步骤632)。 If the automatic mode is identified at step 626, based on the comparison result of step 624, for selecting a desired communications network (step 632 of FIG. 6) automatically by the wireless device. 如果在步骤626中标识了手动模式，则无线设备可视地将可用且允许的网络显示给终端用户（图6的步骤628)。 In step 626, if the manual mode is identified, the wireless device visually displays the available and allowed networks to the end user (step 628 of FIG. 6). 然后，终端用户通过无线设备的用户接口来选择网络，并且将该状态用信号通知给网络选择器（图6的步骤630)，同时在步骤632中选择用于通信的所希望的网络。 Then, the end user through a user interface to select a wireless network device, and this state is signaled (step 630 of FIG. 6) to the network selector for simultaneous selection of a desired communication network in step 632. 图7是用于通过WLAN传送且在无线设备接收的普通容器消息的消息格式的一个实例。  FIG. 7 is an example of a message format of messages transmitted through an ordinary container WLAN and received at the wireless device. 在该特定实例中，普通容器消息702包括标记字段704、版本字段706、长度字段708、 技术/标准组织字段710和特定技术容器字段712。 In this particular example, Common container message 702 includes a tag field 704, a version field 706, a length field 708, a technical / standards organization field 710 and technology-specific container field 712. 标记字段704包含将消息标识为普通容器消息的数据；版本字段706包含用于标识普通容器消息702的（标准）版本的数据；组织字段708包含用于标识如何对特定技术容器712的内容和格式进行定义的数据；长度字段710包含用于标识特定技术容器712的数据长度的数据；以及特定技术容器712包括蜂窝广播信息，该信息特别用于在组织字段708中标识的特定蜂窝技术。 Tag field 704 comprises the data identifying the message as an ordinary container message; Version field 706 contains the (standard) versions of the data for identifying common container message 702; organization field 708 contains the specific technology used to identify how the content and format of the container 712 defining data; length field 710 contains data for identifying the data length of technology-specific container 712; and a technology-specific container 712 includes cellular broadcast information which is used particularly in a tissue field 708 of a particular cellular technology identified. 可以在普通容器消息702中顺序提供多个特定技术容器和相应的长度和组织标识符（这取决于在WLAN的覆盖区域中可用的蜂窝网络的数量）。 Technology-specific container may be provided and a plurality of corresponding length and organization identifier (depending on the number available in a coverage area of ​​the WLAN cellular network) message in the normal container 702 sequentially. 显然，因为可以借助于在组织字段708中标识的蜂窝标准组织来定义在特定技术容器712中的信息的内容和格式，所以普通容器消息702是"一般的"。  Clearly, since cellular standards organization field 708 identifies the organization to define the content and format of the information in technology-specific container 712 by means of, so the ordinary container message 702 is "generic." 尽管整个普通容器消息702具有预先确定的消息格式（如该特定实例所揭示的），但是在特定技术容器712 中的内容和格式可以比较灵活地由不同的蜂窝标准组织进行定义。 Although the entire common container message 702 has a predetermined message format (as this specific example disclosed), the content and format of technology-specific container 712 may be defined by flexible different cellular standard organizations. 无线设备使用组织字段708来选择合适的技术，以用于对特定技术容器712中的信息进行解码。 Organization field wireless device 708 to select the appropriate technique for decoding the information in technology-specific container 712. 正如上述所描述的，普通容器消息可以选择性地或者额外地包括来自可用于WLAN 的不同类型的无线网络（例如Wi-ΜΧ)的无线网络广播消息。  As described above, the ordinary container message may alternatively or additionally include wireless network broadcast information from different types of wireless networks may be used for the WLAN (e.g., Wi-ΜΧ) a. 图7中的普通容器消息702 的消息格式仅是一个具体的例子，其变型方式有很多种。 Common container message 702 in FIG. 7 message format is merely one specific example, there are many variations thereof manner. 例如，普通容器消息可以包括标记字段和特定技术容器，但不包括其它的字段。 For example, ordinary container message may include a tag field and a technology-specific container but does not include other fields. 图8中示出了普通容器消息802的一种可选择实例。 In FIG. 8 shows an alternative example of a conventional container message 802. 在这种情况下，可以隐含在特定技术容器中存在的特定蜂窝技术格式/协议。 In this case, the specific cellular technology format may be implicitly present in the technology-specific container / protocol. 作为选择，可以在标记字段中表明特定蜂窝技术格式/协议。 Alternatively, the specific cellular technology format may indicate / protocols in the flag field. 移动台读取特定技术容器中的信息，特定技术容器在标识另一个标记字段时结束。 The mobile station reads the information in technology-specific container, and technology-specific container ends when another tag field is identified. 作为另一个实例，普通容器消息包括标记字段、版本字段和特定技术容器，但不包括其它的字段。 As another example, ordinary container message includes a tag field, a version field and a technology-specific container but does not include other fields. 在又一个实例中，普通容器消息包括标记字段、版本字段、长度字段和特定技术容器。 In yet another example, ordinary container message includes a tag field, a version field, a length field and a technology-specific container. 正如这里所描述的，向一个或者多个无线设备提供网络广播信息的示例性WLAN 方法包括如下步骤：从一个或者多个可用蜂窝网络或者网络数据库接收与该一个或者多个可用蜂窝网络相关联的蜂窝网络广播信息；在普通容器消息中提供蜂窝网络广播信息，该普通容器消息在内容和格式上按照与所述一个或者多个可用蜂窝网络相关联的一个或者多个蜂窝标准而变化；并且使该普通容器消息针对接收规则地进行广播，同时由无线设备使用。  As described herein, providing network broadcast information to one or more wireless devices of an exemplary WLAN method comprising the steps of: receiving the one or more available cellular networks from the one or more available cellular networks or a network database the cellular network broadcast information associated; provide the cellular network broadcast information message in the conventional case, the message in accordance with a common container or a plurality of the one or more cellular standards available cellular networks associated vary in content and format ; and it makes the ordinary container for receiving a message regularly broadcast, use by the wireless device. 本发明的计算机程序产品包括存储介质和在存储介质上存储的计算机指令，其中这些计算机指令通过所述一个或者多个用于执行所述方法的WLAN的处理器来执行。 The computer program product of the present invention includes a storage medium and computer instructions stored on the storage medium, wherein the computer instructions executed by the one or plurality of said method for performing a WLAN processor. 类似的， 本发明的WLAN适合于从一个或者多个可用蜂窝网络或者网络数据库接收与该一个或者多个可用蜂窝网络相关联的蜂窝网络广播信息；在普通容器消息中提供蜂窝网络广播信息， 该普通容器消息在内容和格式上按照与所述一个或者多个可用蜂窝网络相关联的一个或者多个蜂窝标准而变化；并且使该普通容器消息针对接收规则地进行广播，同时由无线设备使用。 Similar, WLAN according to the present invention is suitable for the one or more available cellular network broadcast information associated with the cellular network receives from one or more available cellular networks or a network database; providing the cellular network broadcast information message in the conventional case, the Common container message varies in content and format according to one or more of the one or more cellular standards associated with the available cellular networks; and makes the ordinary container for receiving a broadcast message regularly, while using the wireless device. 应当注意，所述普通容器消息可以选择性地或者额外地包括来自可用于WLAN的不同类型无线网络（例如Wi-ΜΧ)的无线网络广播信息。 It should be noted that the ordinary container message may alternatively or additionally include wireless network broadcast information from different types of wireless networks may be used for the WLAN (e.g., Wi-ΜΧ) a. 涉及上述技术的一种示例性的、用于接收并处理来自无线局域网的网络广播信息的无线设备方法包括如下步骤：监控来自无线局域网的广播信息；从无线局域网接收由该无线局域网规则地进行广播的普通容器消息，该普通容器消息包括与一个或者多个可用蜂窝网络相关联的蜂窝网络广播信息，该普通容器消息在内容和格式上按照与所述一个或者多个可用蜂窝网络相关联的一个或者多个蜂窝标准而变化；对所述普通容器消息进行解码以标识与一个或者多个可用蜂窝网络相关联的蜂窝网络广播信息；并且将所述蜂窝网络广播信息存储到存储器中。  The above-described technique involves an exemplary wireless device for receiving and processing network broadcast information from a method for wireless local area network comprising the steps of: monitoring the broadcast information from a wireless local area network; rules received by the wireless LAN from the wireless LAN Common container message to be broadcast, the normal broadcast container message includes cellular network information associated with one or more available cellular networks associated with the message according to the conventional case associated with the one or more available cellular networks on the content and format with one or more cellular standards vary; the ordinary container message to identify cellular network decodes the broadcast information associated with one or more available cellular networks associated; and the cellular network broadcast information stored in the memory. 本发明的计算机程序产品包括存储介质和在存储介质上存储的计算机指令，其中这些计算机指令通过所述一个或者多个用于执行所述方法的无线设备的处理器来执行。 The computer program product of the present invention includes a storage medium and computer instructions stored on the storage medium, wherein the computer instructions executed by the one or more wireless device performing the method for a processor. 本发明的无线设备包括一个或者多个处理器；与所述一个或者多个处理器相连的存储器；与所述一个或者多个处理器相连的射频（RF)收发信机；以及与所述RF收发信机相连的天线。 The wireless device according to the present invention comprises one or more processors; memory coupled to said one or more processors coupled; radio with the one or more processors coupled to the (RF) transceiver; and with the RF a transceiver connected to an antenna. 所述无线设备的一个或者多个处理器使用RF收发信机、可操作地监控来自无线局域网的广播信息；接收由无线局域网规则地进行广播的普通容器消息，所述普通容器消息包括与一个或者多个可用蜂窝网络相关联的蜂窝网络广播信息，该普通容器消息在内容和格式上按照与所述一个或者多个可用蜂窝网络相关联的一个或者多个蜂窝标准而变化；解码所述普通容器消息，以标识与所述一个或者多个可用蜂窝网络相关联的蜂窝网络广播信息；并且将所述蜂窝网络广播信息存储到存储器中。 The wireless device one or more processors to use RF transceiver, operable to monitor the broadcast information from a wireless local area network; Normal Normal container message received container message by the WLAN broadcast regularly, comprising said one or a plurality of cellular network information associated with the available cellular networks, in the ordinary container message content and format according to one or more of the one or more cellular standards associated with the available cellular networks varies; common decoding the container message, to identify the one or more available cellular network information associated with the cellular network; and the cellular network broadcast information stored in the memory. 所述无线设备可以是双模设备也可以是单模设备。 The wireless device may be a dual mode device may be a single mode device. 应当注意，所述普通容器消息可以选择性地或者额外地包括来自可用于WLAN的不同类型无线网络（例如Wi-ΜΧ)的无线网络广播信息。 It should be noted that the ordinary container message may alternatively or additionally include wireless network broadcast information from different types of wireless networks may be used for the WLAN (e.g., Wi-ΜΧ) a. 使用一种可选择技术，用于向一个或者多个无线设备提供网络广播信息的示例性WLAN方法包括如下步骤：从一个或者多个可用蜂窝网络或者网络数据库接收与该一个或者多个可用蜂窝网络相关联的蜂窝网络广播信息；在普通容器消息中提供蜂窝网络广播信息，该普通容器消息在内容和格式上按照与所述一个或者多个可用蜂窝网络相关联的一个或者多个蜂窝标准而变化；从无线设备接收探查请求；并且响应所述探查请求使该普通容器消息发送到无线设备。  Using an alternative technique for providing network broadcast information to one or more wireless devices of an exemplary WLAN method comprising the steps of: receiving from one or more of the one or more available cellular networks or a network database available cellular network information associated with the cellular network; providing the cellular network broadcast information message in the conventional case, in the ordinary container message content and format according to one or more of the cell of one or more available cellular networks associated standards vary; receiving a probe request from a wireless device; and in response to the probe request message so that the ordinary container to the wireless device. 该可选方法可以包括其它的步骤：对网络交互工作指示符进行规则地广播，其中网络交互工作指示符表示来自WLAN的蜂窝网络广播信息是否可用。 This alternative method may further comprise the step of: the network interworking indicator to be regularly broadcast a network interworking indicator which indicates cellular network broadcast information is available from the WLAN. 本发明的计算机程序产品包括存储介质和在存储介质上存储的计算机指令，其中这些计算机指令通过所述一个或者多个用于执行所述方法的WLAN的处理器来执行。 The computer program product of the present invention includes a storage medium and computer instructions stored on the storage medium, wherein the computer instructions executed by the one or plurality of said method for performing a WLAN processor. 本发明的WLAN适合于从一个或者多个可用蜂窝网络或者网络数据库接收与该一个或者多个可用蜂窝网络相关联的蜂窝网络广播信息；在普通容器消息中提供蜂窝网络广播信息，该普通容器消息在内容和格式上按照与所述一个或者多个可用蜂窝网络相关联的一个或者多个蜂窝标准而变化；从无线设备接收探查请求；并且响应所述探查请求使该普通容器消息发送到无线设备。 WLAN according to the present invention is adapted to receive the one or more cellular network broadcast information associated with the available cellular networks from the one or more available cellular networks or a network database; providing the cellular network broadcast information message in the conventional case, the ordinary container message vary in content and format according to one or more of the one or more cellular standards associated with the available cellular networks; receiving a probe request from a wireless device; and in response to the probe request message so that the normal to the wireless device container . 该WLAN可以进一步适合于规则地广播网络交互工作指示符，其中所述网络交互工作指示符用于表示来自WLAN的蜂窝网络广播信息是否可用。 The WLAN may be further adapted to regularly broadcast a network interworking indicator, wherein said network interworking indicator for indicating the cellular network broadcast information is available from the WLAN. 应当注意，所述普通容器消息可以选择性地或者额外地包括来自可用于WLAN的不同类型无线网络（例如Wi-ΜΧ)的无线网络广播信息。 It should be noted that the ordinary container message may alternatively or additionally include wireless network broadcast information from different types of wireless networks may be used for the WLAN (e.g., Wi-ΜΧ) a. 涉及可选技术的一种用于接收并处理来自无线局域网的网络广播信息的无线设备方法包括如下步骤：将探查请求发送到无线局域网；接收响应所述探查请求来自无线局域网的普通容器消息，该普通容器消息在内容和格式上按照与所述一个或者多个可用蜂窝网络相关联的一个或者多个蜂窝标准而变化；对所述普通容器消息进行解码以标识与一个或者多个可用蜂窝网络相关联的蜂窝网络广播信息；并且将所述蜂窝网络广播信息存储到存储器中。  Optionally art relates to a method of a wireless device for receiving and processing network broadcast information from a wireless local area network comprising the steps of: transmitting a probe request to the WLAN; receiving a response to the probe request from the wireless LAN in the conventional case message, the message is changed in accordance with the conventional case with the one or more one or more cellular standards associated with the available cellular networks in content and format; the general message is decoded to identify the container with one or more available cellular network information associated with the cellular network; and the cellular network broadcast information stored in the memory. 该可选方法还可以包括其它的步骤：接收广播网络交互工作指示符，其中所述网络交互工作指示符用于表示蜂窝网络广播信息是否可用。 This alternative method may further comprise additional steps of: receiving a broadcast network interworking indicator, wherein said network interworking indicator for indicating whether the cellular network information is available. 本发明的计算机程序产品包括存储介质和在存储介质上存储的计算机指令，其中这些计算机指令通过所述一个或者多个用于执行所述方法的无线设备的处理器来执行。 The computer program product of the present invention includes a storage medium and computer instructions stored on the storage medium, wherein the computer instructions executed by the one or more wireless device performing the method for a processor. 本发明的无线设备包括一个或者多个处理器；与所述一个或者多个处理器相连的存储器；与所述一个或者多个处理器相连的射频(RF)收发信机；以及与所述RF收发信机相连的天线。 The wireless device according to the present invention comprises one or more processors; memory coupled to said one or more processors coupled; radio with the one or more processors coupled to the (RF) transceiver; and with the RF a transceiver connected to an antenna. 所述无线设备的一个或者多个处理器可操作地将探查请求发送到无线局域网；接收响应所述探查请求来自无线局域网的普通容器消息，该普通容器消息在内容和格式上按照与所述一个或者多个可用蜂窝网络相关联的一个或者多个蜂窝标准而变化；解码所述普通容器消息，以标识与所述一个或者多个可用蜂窝网络相关联的蜂窝网络广播信息；并且将所述蜂窝网络广播信息存储到无线设备的存储器中。 The one or more wireless device processor is operable to send a probe request to the WLAN; receiving a response to the probe request message from the wireless LAN conventional case, which is the ordinary container message content and format in accordance with the one or more of the one or more cellular standards associated with the available cellular networks varies; decoding the ordinary container message to identify the one or more available cellular network information associated with the cellular network; and the cellular network information stored in the memory of the wireless device. 所述一个或者多个处理器还可以可操作地接收广播网络交互工作指示符，其中所述网络交互工作指示符用于表示蜂窝网络广播信息是否可用。 The one or more processors may be operable to receive a broadcast network interworking indicator, wherein said network interworking indicator for indicating whether the cellular network information is available. 应当注意，所述普通容器消息可以选择性地或者额外地包括来自可用于WLAN的不同类型无线网络（例如Wi-ΜΧ)的无线网络广播信息。 It should be noted that the ordinary container message may alternatively or additionally include wireless network broadcast information from different types of wireless networks may be used for the WLAN (e.g., Wi-ΜΧ) a. 本发明的上述实施方式仅仅旨在举例说明。 The above embodiment  of the present invention is merely intended to be illustrative. 例如，尽管无线设备起初作为"双模" 设备进行描述，但作为选择还可以是仅通过WLAN进行通信"单模"设备。 For example, although the wireless device initially as a "dual mode" apparatus is described, but alternatively may also be communication only "single mode" device via WLAN. 本领域的普通技术人员可以在不脱离本发明范围的情况下，实现对特定实施方式的改变、修改和变型。 Those of ordinary skill in the art may be made without departing from the scope of the invention, to achieve the change of specific embodiments, modifications and variations. 1. 一种在无线局域网中向无线设备提供网络信息的方法，该方法包括步骤： 向无线设备提供网络交互工作指示符； 从无线设备接收请求消息，以请求与一个或者多个网络相关联并标识一个或多个网络的网络信息；以及响应于请求消息，在普通容器消息中提供网络信息，以传送给无线设备，定义所述普通容器消息包括： 容器字段，用于提供网络信息，所述网络信息根据标准组织进行格式化。 1. A method for providing network information to the wireless device in a wireless local area network, the method comprising the steps of: providing a network interworking indicator to the wireless device; receiving a request message from the wireless device to request one or more networks and associated network information identifying one or more networks; and in response to the request message, the network information provided in a common container message to transmit to the wireless device, the message defining the common container comprising: a container field for providing network information, the network information formatted in accordance with standards organizations. 2. 根据权利要求1所述的方法，其中还定义所述普通容器消息包括： 第二容器字段，用于提供与第二网络相关联的第二网络信息，所述第二网络信息根据第二标准组织进行格式化。 2. The method according to claim 1, wherein the container further defining the common message comprises: a second container field for providing second network information associated with a second network, the second network information according to a second standards organization format. 3. 根据权利要求2所述的方法，其中与所述容器字段相关联的标准组织不同于与所述第二容器字段相关联的第二标准组织。 The method according to claim 2, wherein the standard container field associated with the second container field is different from a second standard organization associated with the organization. 4. 根据权利要求2所述的方法，其中还定义所述第二容器字段包括网络标识，所述网络标识包括标识第二网络的系统标识SID。 4. The method according to claim 2, wherein the second container further defining the field includes a network identifier, the network identifier identifying the second network comprises a system identification SID. 5. 根据权利要求2所述的方法，其中所述网络是第一蜂窝网络，以及所述第二网络是第二蜂窝网络。 5. The method according to claim 2, wherein said first network is a cellular network and the second network is a second cellular network. 6. 根据权利要求1所述的方法，其中还定义所述普通容器消息包括： 长度字段，用于标识容器字段的数据长度。 6. The method according to claim 1, wherein the container further defining the common message comprises: a length field for identifying the data length of the container field. 7. 根据权利要求1所述的方法，其中，根据与网络类型相关联的通信协议来配置所述普通容器消息的格式，并且还定义所述容器字段标识所述网络类型。 The method according to claim 1, wherein, according to the type of communication protocol associated with the network configured with the format of the message is the conventional case, and also defines the container field identifying the network type. 8. 根据权利要求1所述的方法，其中还定义所述普通容器消息包括： 标记字段，用于将消息标识为普通容器消息。 Common container message 8. The method according to claim 1, wherein defining the further comprising: a tag field for identifying the message as an ordinary container message. 9. 一种在无线局域网WLAN中向无线设备提供网络信息的设备，包括： 用于向无线设备提供网络交互工作指示符的装置； 用于从无线设备接收消息以请求与一个或者多个网络相关联、并标识一个或多个网络的网络信息的装置；以及用于响应于接收消息在普通容器消息中提供所述网络信息以传送至无线设备的装置， 定义所述普通容器消息包括： 容器字段，用于提供网络信息，所述网络信息根据标准组织进行格式化。 A network information providing device to the wireless device in a wireless local area network WLAN, comprising: means for providing a network interworking indicator to the wireless device; means for receiving a message from the wireless device to request the network associated with one or more means associated network information, and identifies one or more networks; and means for providing the network information in response to the means for transmitting to the wireless device, the container defining the common message comprises receiving a message in the message in an ordinary container: container field , for providing the network information, the network information is formatted according to standards organizations. 10. 根据权利要求9所述的设备，其中还定义所述普通容器消息包括： 第二容器字段，用于提供与第二网络相关联的第二网络信息，所述第二网络信息根据第二标准组织进行格式化。 10. The apparatus according to claim 9, wherein the container further defining the common message comprises: a second container field for providing second network information associated with a second network, the second network information according to a second standards organization format. 11. 根据权利要求10所述的设备，其中与所述容器字段相关联的标准组织不同于与所述第二容器字段相关联的第二标准组织。 11. The apparatus of claim 10, wherein the container field standard organization associated with a second standard different from the tissue and the second container field is associated. 12. 根据权利要求10所述的设备，其中还定义所述第二容器字段包括网络标识，所述网络标识包括标识第二网络的系统标识SID。 12. The apparatus according to claim 10, wherein the second container further defining the field includes a network identifier, the network identifier identifying the second network comprises a system identification SID. 13. 根据权利要求10所述的设备，其中定义所述容器字段指示第一蜂窝网络，并且定义第二容器字段指示第二蜂窝网络。 13. The apparatus according to claim 10, wherein said container defines a first field indicative of a cellular network, and the second container defines a second field indicating the cellular network. 14. 根据权利要求9所述的设备，其中还定义所述普通容器消息包括： 长度字段，用于标识容器字段的数据长度。 14. The apparatus according to claim 9, wherein the container further defining the common message comprises: a length field for identifying the data length of the container field. 15.-种无线设备中的用于接收并处理无线局域网中的网络信息的方法，该方法包括下述步骤： 在无线设备处接收网络交互工作指示符； 响应于网络交互工作指示符，请求与一个或多个网络相关联并标识一个或多个网络的网络彳目息； 响应于对网络信息的请求，接收网络信息，其中在普通容器消息中提供所述网络信息， 标识能够用于与无线设备通信的一个或多个网络；以及解码所述普通容器信息，以识别与一个或多个网络相关联的网络信息，定义所述普通容器消息包括： 容器字段，用于提供网络信息，所述网络信息根据标准组织进行格式化。 15.- Method species wireless device for receiving and processing network information in the wireless local area network, the method comprising the steps of: receiving a network interworking indicator at the wireless device; in response to a network interworking indicator request a left foot or more network mesh network information associated with and identifying one or more networks; in response to a request for network information, the network information received, wherein the network information is provided in a common container message, the identification can be used with a wireless one or more network communications device; and decoding the common vessel information to identify the network information associated with one or more networks, the message defining the common container comprising: a container field for providing network information, the network information formatted in accordance with standards organizations. 16.根据权利要求15的方法，其中还定义所述普通容器消息包括： 第二容器字段，用于提供与第二网络相关联的第二网络信息，所述第二网络信息根据第二标准组织进行格式化。 16. The method according to claim 15, wherein the container further defining the common message comprises: a second container field for providing second network information associated with a second network, the second network information according to a second Standards Organization format. 17.根据权利要求16的方法，其中定义所述容器字段指示第一蜂窝网络，并且定义第二容器字段指示第二蜂窝网络。 17. The method of claim 16, wherein said container defines a first field indicative of a cellular network, and the second container defines a second field indicating the cellular network. 18.根据权利要求16所述的方法，其中还定义所述第二容器字段包括网络标识，所述网络标识包括标识第二网络的系统标识SID。 18. The method according to claim 16, wherein the second container further defining the field includes a network identifier, the network identifier identifying the second network comprises a system identification SID. 19.根据权利要求15所述的方法，其中还定义所述普通容器消息包括： 长度字段，用于标识容器字段的数据长度。 19. The method according to claim 15, wherein the container further defining the common message comprises: a length field for identifying the data length of the container field. 20. 根据权利要求15所述的方法，其中根据与网络类型相关联的通信协议来配置所述普通容器消息的格式，并且还定义所述容器字段标识所述网络类型。 20. The method according to claim 15, wherein the container is configured format of the message according to the common communication protocol associated with a network-linked type, and also defines the container field identifying the network type. 21. 根据权利要求15所述的方法，其中还定义所述普通容器消息包括： 标记字段，用于将消息标识为普通容器消息。 21. The method of claim 15, wherein the container further defines the general message comprising: a tag field for identifying the message as an ordinary container message. 22. -种无线设备中的用于接收并处理无线局域网中的网络信息的设备，包括： 用于在无线设备处接收网络交互工作指示符的装置； 用于响应于网络交互工作指示符请求与一个或多个网络相关联并标识一个或多个网络的网络信息的装置； 用于响应于对网络信息的请求接收网络信息的装置，其中在普通容器消息中提供网络广播信息，标识能够用于与无线设备通信的一个或多个网络；以及用于解码所述普通容器信息以识别与一个或多个网络相关联的网络信息的装置，定义所述普通容器消息包括： 容器字段，用于提供网络信息，所述网络信息根据标准组织进行格式化。 22. - kind of wireless device apparatus for receiving and processing network information in the wireless local area network, comprising: means for receiving a network interworking indicator at the wireless device; response indicator for a request with the network interworking means one or more network information associated with the network and identify one or more networks; means for receiving the network information in response to a request for network information, wherein providing network broadcast information message in the conventional case, it can be used to identify network communication with one or more wireless device; and means for decoding the information in the ordinary container apparatus network information identifying the one or more associated network, defining the common message container comprising: a container field for providing network information, the network information is formatted according to standards organizations. 23.根据权利要求22所述的设备，其中还定义所述普通容器消息包括： 第二容器字段，用于提供与第二网络相关联的第二网络信息，所述第二网络信息根据第二标准组织进行格式化。 23. The apparatus according to claim 22, wherein the container further defining the common message comprises: a second container field for providing second network information associated with a second network, the second network information according to a second standards organization format. 24.根据权利要求23所述的设备，其中在所述普通容器消息中规定标准组织，还定义所述容器字段包括网络标识，所述网络标识包括根据所述标准组织格式化的移动网络代码MNC和移动国家代码MCC。 24. The apparatus according to claim 23, wherein a predetermined message in the normal standard tissue container, the container further defining the field includes a network identifier, the network identification comprises a mobile network code MNC formatted according to the standards organizations and a mobile country code MCC. 25. 根据权利要求22所述的设备，其中定义所述容器字段包括能够用于与无线设备通信的、一个或多个网络中的每一个的网络标识。 25. The apparatus according to claim 22, wherein defining the field includes a container can be used for communicating with a wireless device, a network identification for each of one or more networks. 26. 根据权利要求22所述的设备，其中根据与网络类型相关联的通信协议来配置所述普通容器消息的格式，并且还定义所述容器字段标识不同类型的网络中的至少一个。 26. The apparatus according to claim 22, wherein the configured according to the type of communication protocol associated with the network with the message format of the conventional case, and further defining the container field identifies different types of networks in at least one.